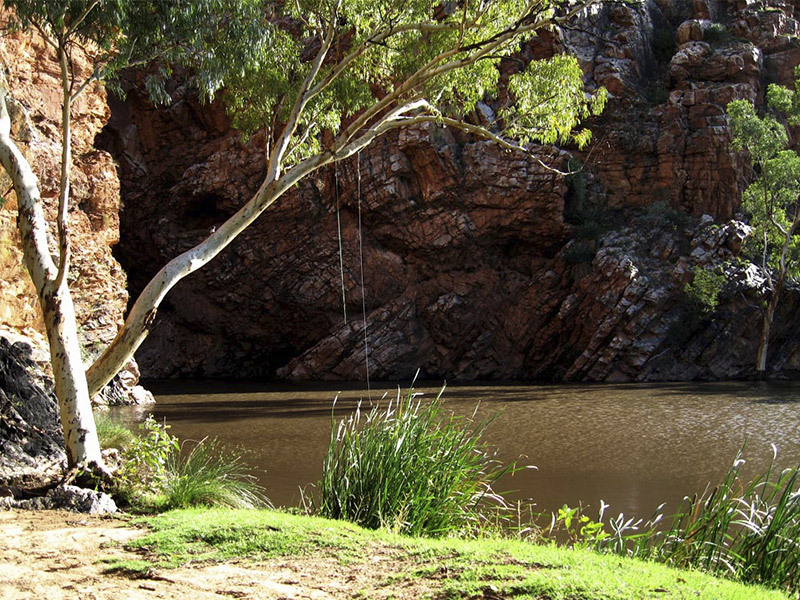 Use the map to see a few of the many varied locations that you will discover on your adventure! 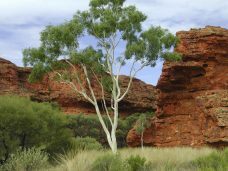 Alice Springs is the main hub of Central Australia and is a wonderful place in the desert to rest, relax and gather yourself. While Alice may not be close to any Aussie beach, it is the closest town to ALL of them (!) 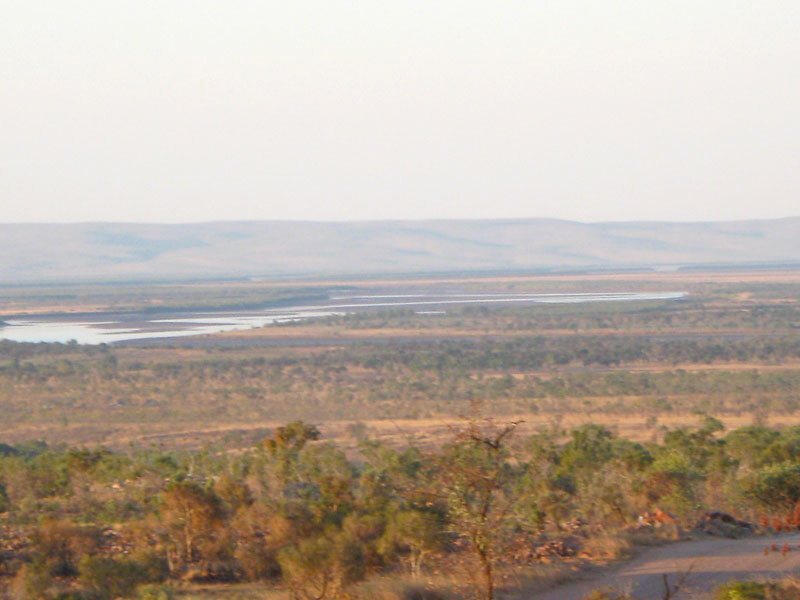 and when the Todd River flows in the wet season, it is indeed a sight to behold. 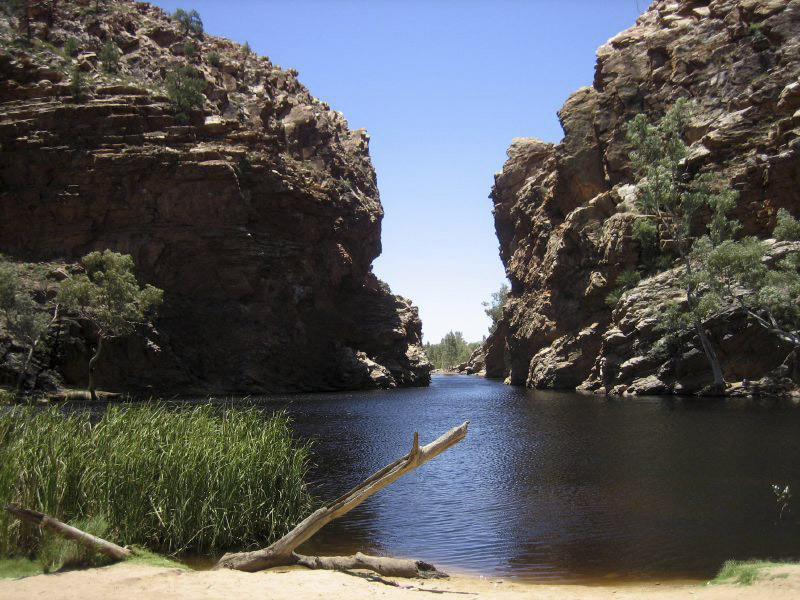 Alice Springs was the name given to a waterhole a little north of the town, found in 1871 during the construction of the Overland Telegraph Line. 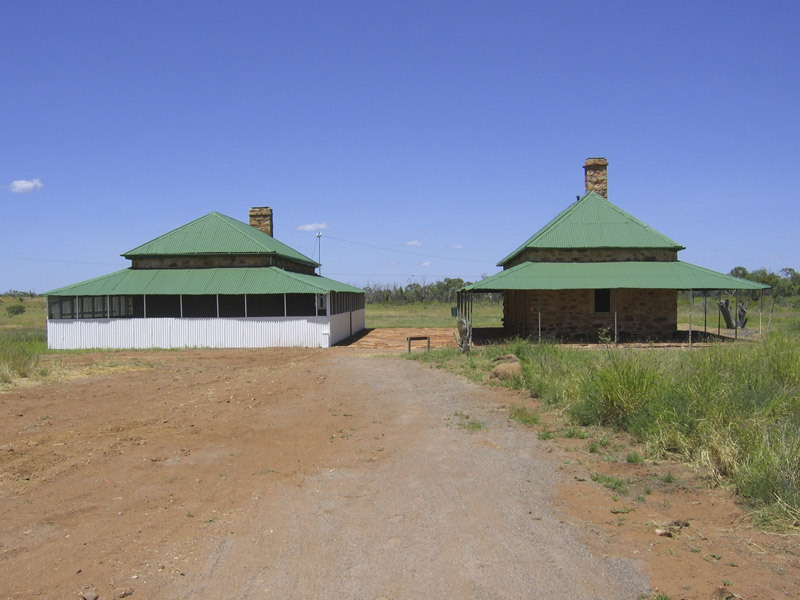 Alice Todd was the wife of Sir Charles Todd who was the Superintendent of Telegraphs. 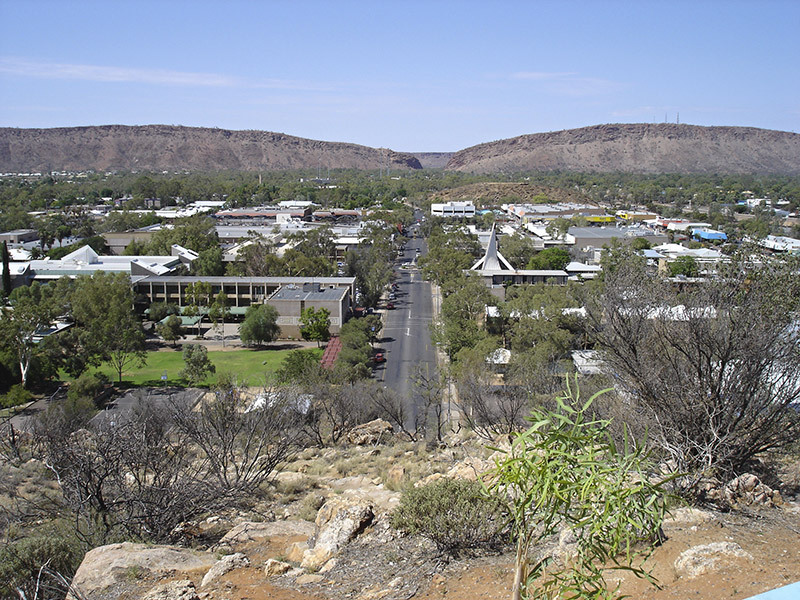 With the town named Stuart after the explorer, there was a lot of confusion created for the administrators in Adelaide when speaking of the town or the telegraph station so in 1933, the town of Stuart officially became known as Alice Springs. However it is important to know that the Arrernte (or Aranda) People have been the original custodians & carers of this region for tens of thousands of years and their name for Alice is Mparntwe (pronounced Mbarn-twa). 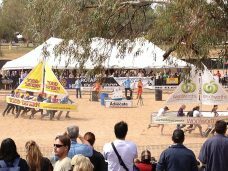 The Arrernte People are ever-present in Alice today and help us to experience the rich culture of Alice unlike any other town. 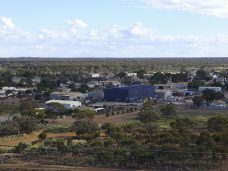 Although it was the telegraph line that made the land south to north viable for pastoralists, it was the discovery of alluvial gold at Arltunga (about 100kms east) in 1887 that caused the population boom for Alice. 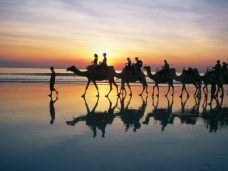 The Afghan Cameleers also have a special place in Alice and are forever recognized for the role they played in opening up the region by providing supplies with their camel trains using ‘The Gahn’ Railway system that now runs between Adelaide & Darwin via Alice Springs. This region not only has shops, museums, parks and art galleries to offer, it is also the gateway to the gems in Central Australia’s crown and yet holds it’s own wonder. 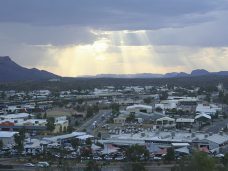 Surrounded by mountains and desert in all directions, this town provides all that you need (and more) and still allows you to feel the isolation of the desert with both majestic sunrises & sunsets. We shall be ‘InJoyIn’ some time here as we gather ourselves before heading west around The Majestic Mereenie Loop & through Central Australia to experience the ‘majik & wonder’ of this delightful desert region firsthand. 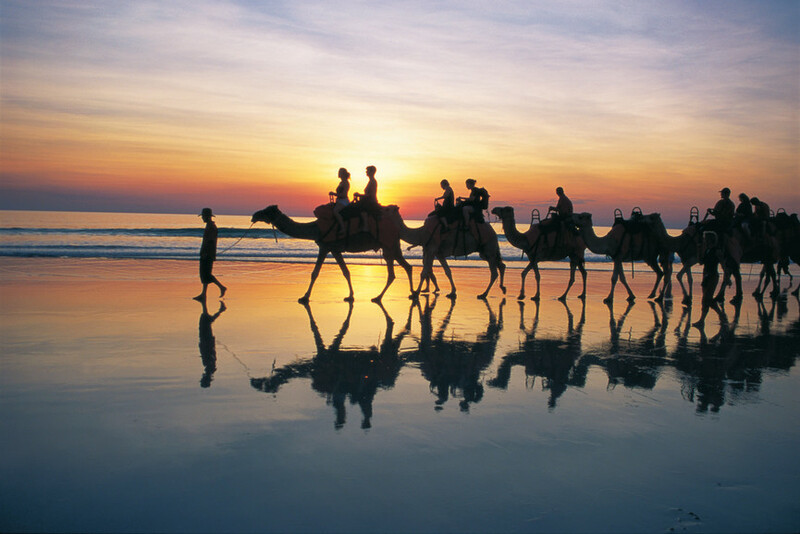 Broome is best known for it’s pearling industry, and in the winter where it is cold in the southern towns of WA the warmer weather and white sandy beaches of Broome help to swell the population from it’s usual amount of 14,000 to over 44,500 people. 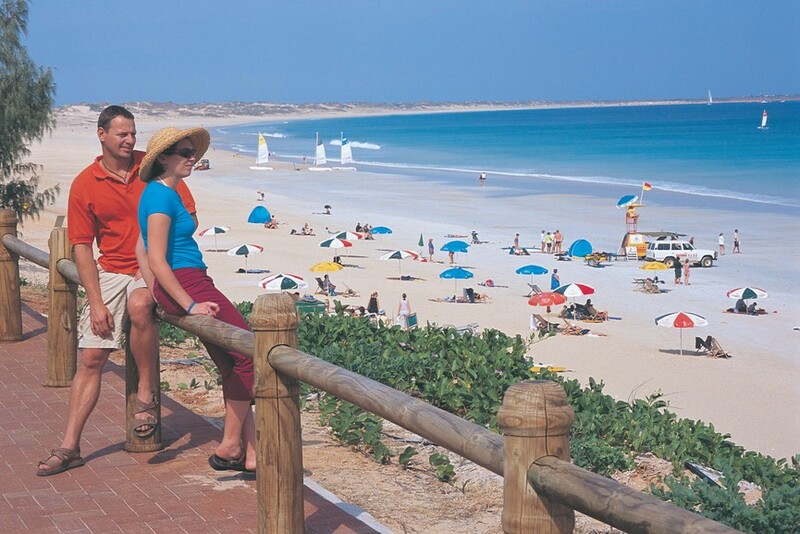 The town’s most popular seaside location Cable Beach was named after an undersea telegraph cable. Set down from Singapore and spanning the ocean to Broome in 1889 this cable helped facilitate communication between England and her colony “down under”. The area’s original pearling industry began in 1866 in Cossack, south of Port Hedland on the Harding River mouth. 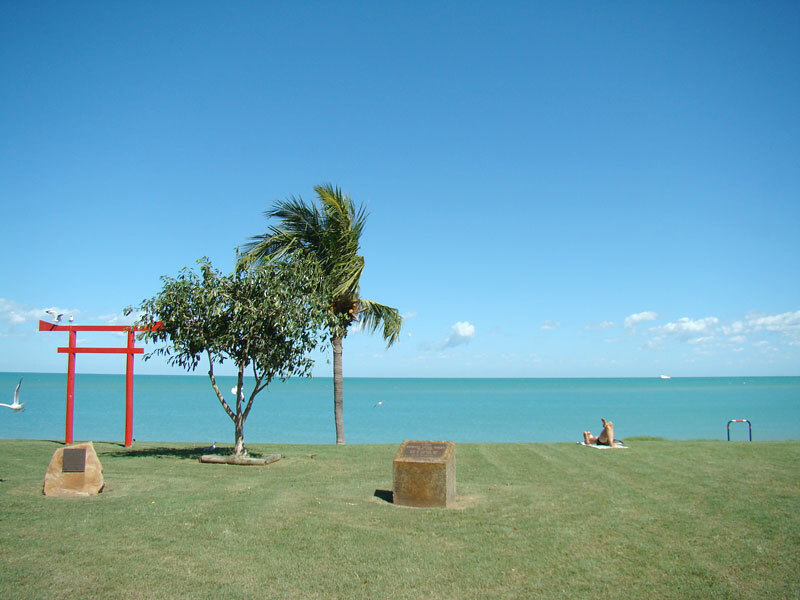 Two decades later the focus was shifted to Broome with Japanese, Chinese, and Aboriginal divers doing a lot of the ground work collecting pearls and shells. 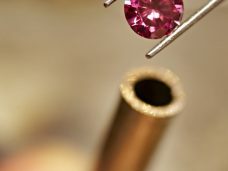 This dangerous work came at a high price costing many lives. 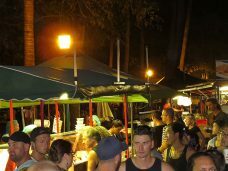 Each year, in September, Broome is host to the Shinju Matsuri Festival (“Festival of the Pearl”), a celebration of the multicultural heritage of the town. The streets come alive with vivid colours, local performers and firework displays. 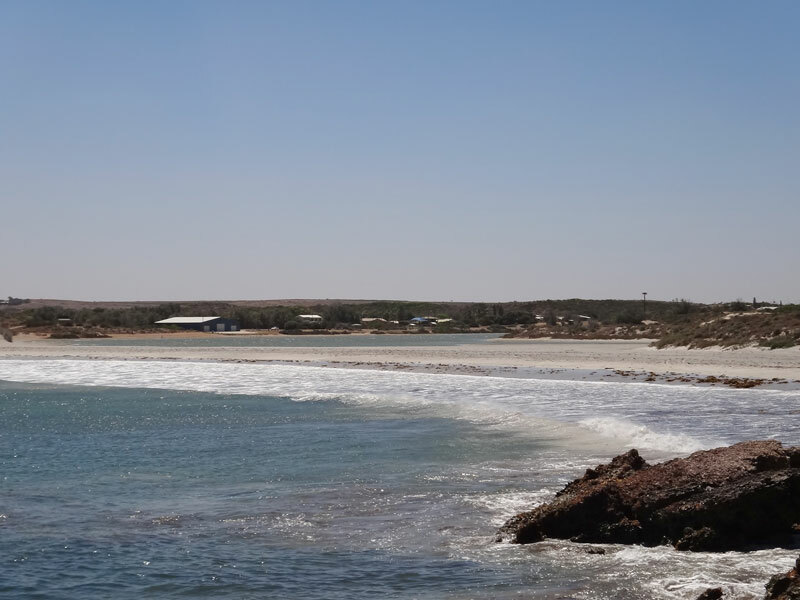 History is brought to life when the tide goes out to reveal dinosaur footprints and fossil remains embedded in the rocks of the shore. 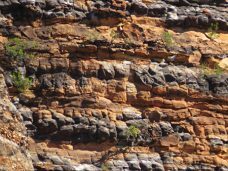 Some of these remains date back to 130 million years ago, leaving an impression in our minds, reminding us of our relatively short time on this land. 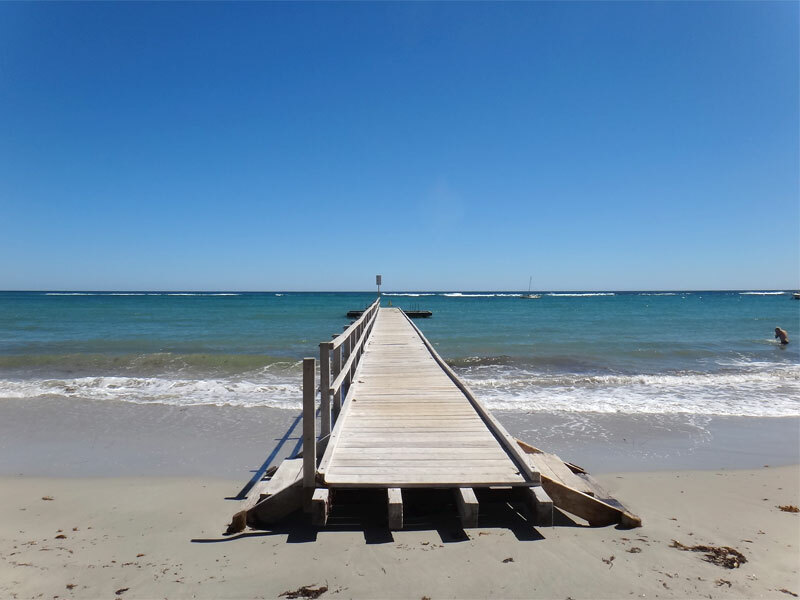 On a night of a full moon and while the tides are still out it you can witness the ripple effect called the “stairway to the moon” on the shimmering light on the water out at Town Beach. This phenomenon can be experienced 2-3 times a month spanning from April through to October each year. 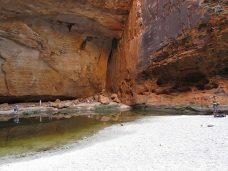 The Bungle Bungles are another of nature’s creations formed slowly over a long period of time. A very long time ago the whole area was once a river bed and, over a period of many years and cycles of seasons, layers of sediment accumulated. 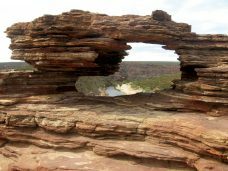 Since then roughly 350 million years has passed and the culmination of so many seasons of rain, wind and harsh dry summers have eroded the landscape leaving the wondrous natural sculptures we can see and appreciate today. The unusual striped earthy colours of the rock formations are the result of living bacteria that is supported by the moisture content preserved in the layers of clay in the limestone. 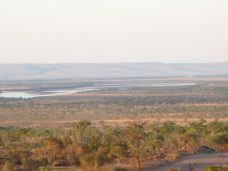 The clay held the water from the wet season and slowly leached it out for the bacteria to survive on leaving it as a grey-black band of colour. 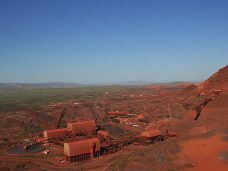 The other red-orange oxidized colour can’t support life and has dried out. The Bungles are a wonderful place to camp and to explore, soaking in the ambiance amongst such natural structures that have taken so long to form and will continue to take shape even as our time has passed by. 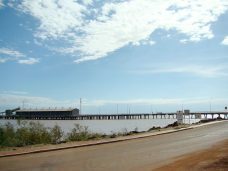 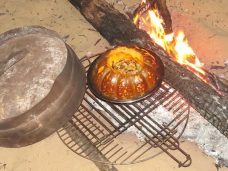 Carnarvon, a fruit n’ veg bowl for the Mid West on the mouth of the Gascoyne River, producing off-season produce to be transported to Perth – Bananas, grapes, mangoes, watermelons, rockmelons, and tomatoes just to name a few. 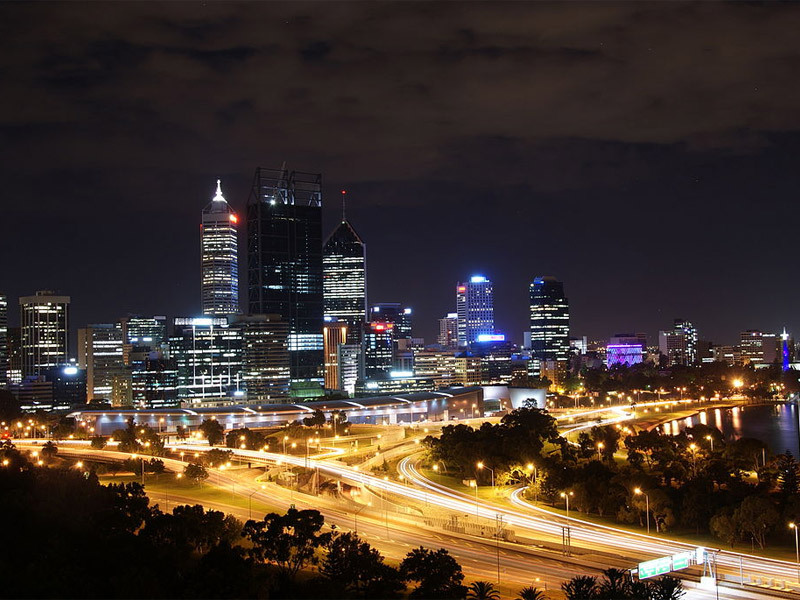 As the winter months are ending and Perth is starting to warm up, Carnarvon has the advantage of a warmer climate that gives them a head start in the growth of produce, which allows them to fill the space before Perth produce can be harvested. 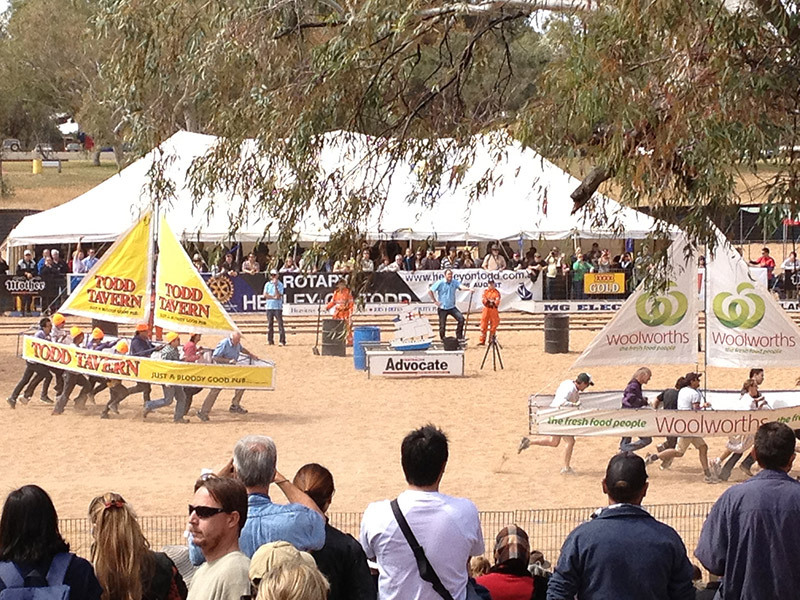 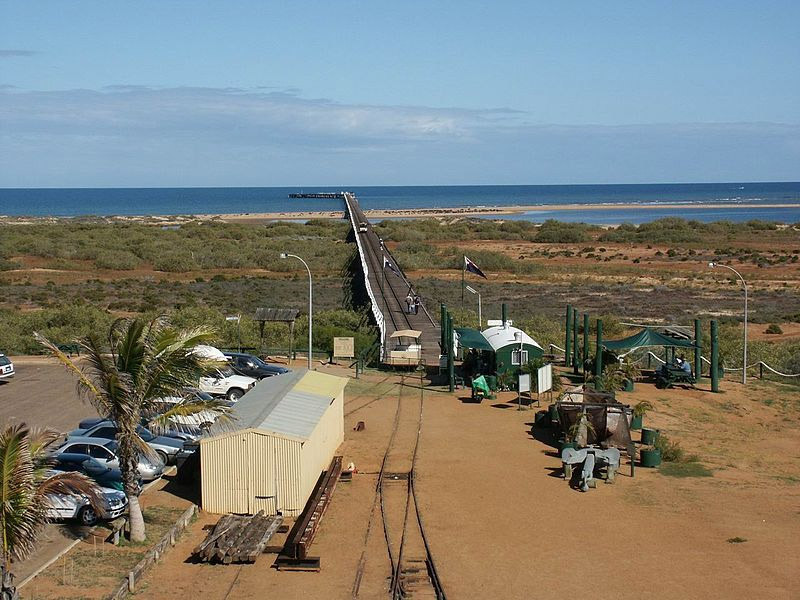 Other industries supporting Carnarvon include a salt mine, sheep & wool, cattle, goats, fishing, prawning, and tourism. 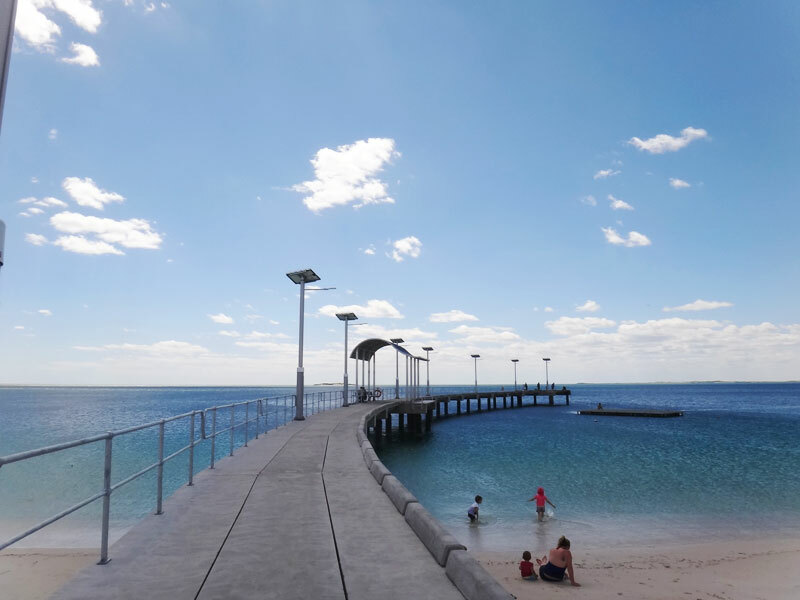 Why not go for a stroll along the One Mile Jetty and try your luck at catchin’ a fish along the way. 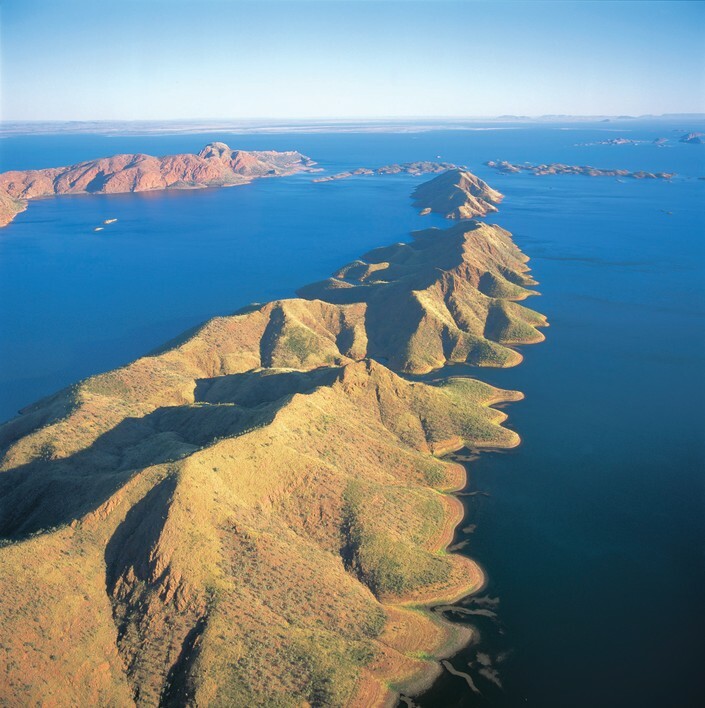 At 1,494 metres long it makes for a nice stroll over the water! 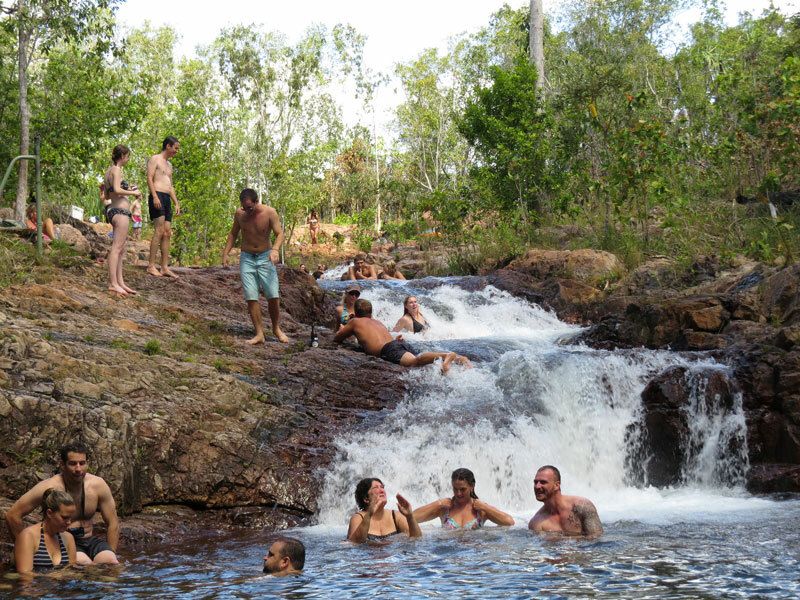 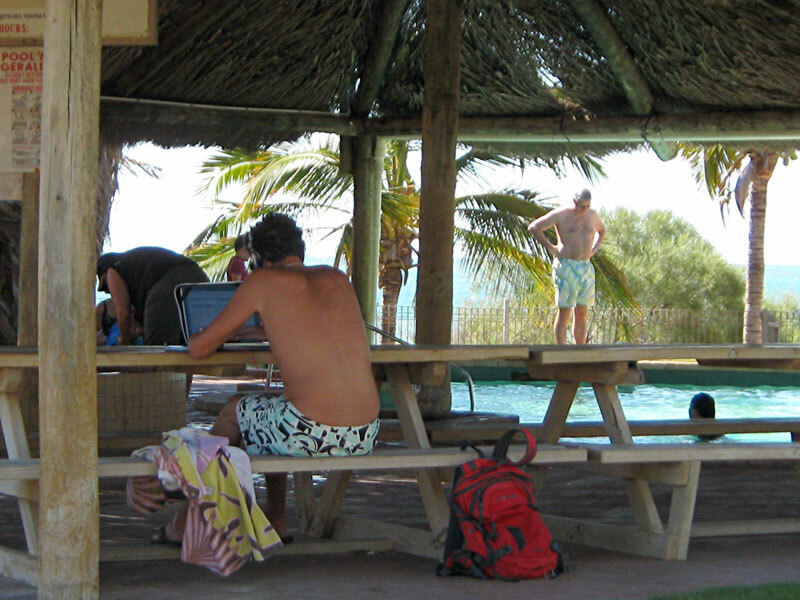 Daly Waters is a quiet watering hole about 600km’s south of Darwin and 7km’s to the west of the Stuart Highway. 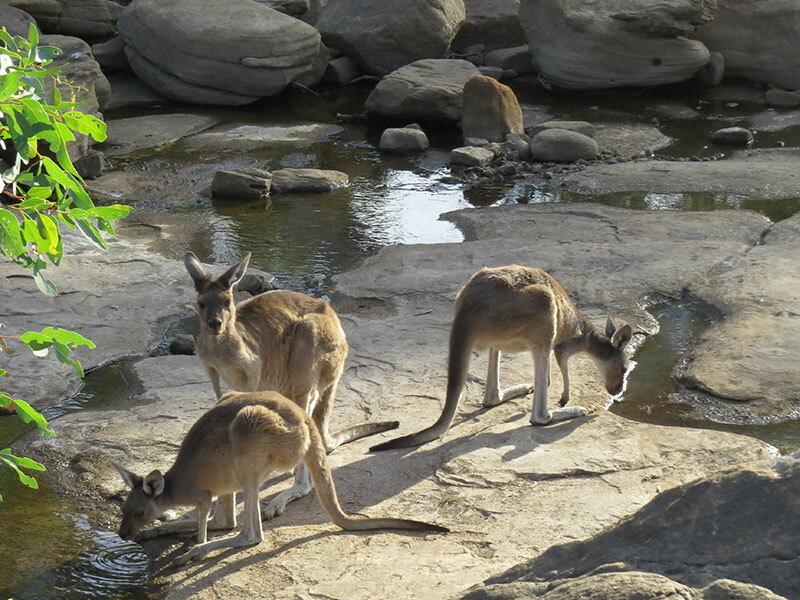 ‘The Watering Hole’ has always been the way of the oasis of Daly Waters. 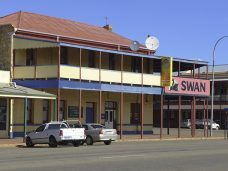 The Hotel is a favourite for Territorians & it has as much colour & character as the town’s history. The first European explorer to come across this phenomenal find was John McDouall Stuart in 1862 on his Journey north. 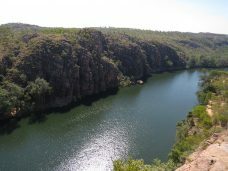 When Stuart discovered fresh water here, he named it Daly Waters after the then governor of South Australia, Dominic Daly. 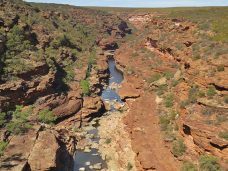 Upon it’s discovery it became a vital watering hole for drovers & their cattle moving across the country between the Barkley Tablelands to the east & the Murranji Track to the west. This was a landmark stop for the Durack Brothers on their famous cattle drive across the country. 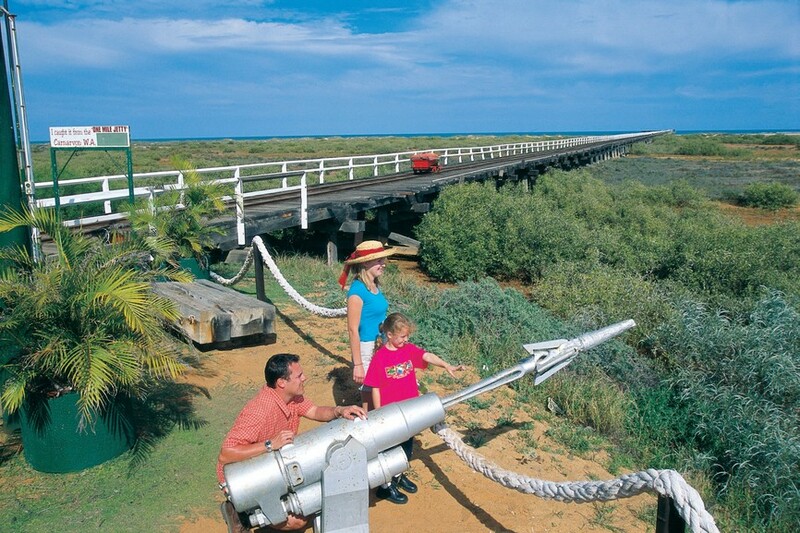 During the early 1870’s the Overland Telegraph Line followed Stuart’s route from south to north across the country. 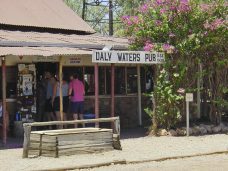 Due to the telegraph line falling behind in this region, Daly Waters was the northern home of ‘The Pony Express’ which ran the 400km’s south to Tennant Creek for 2 months while the line was completed. 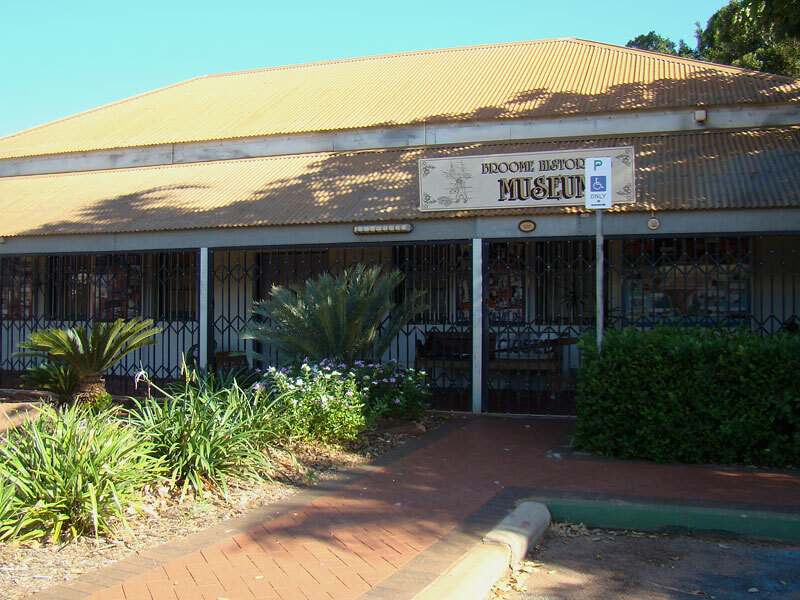 In 1926 it was an International stop over for the London to Sydney Air Race (and continued for other flights after the race), and in 1930 Bill & Henrietta Pearce built a store to service travellers & miners. 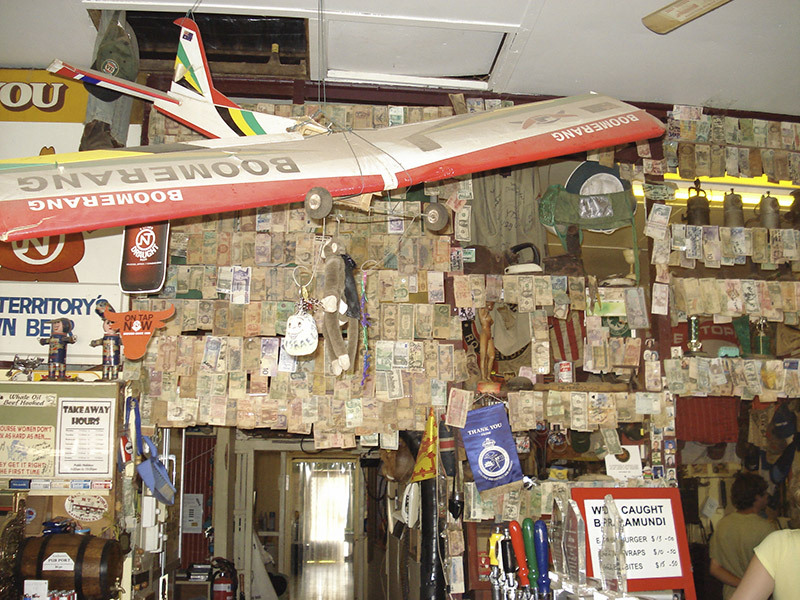 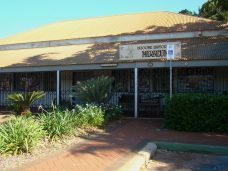 The store (which was providing accommodation by now) was given a ‘jug license’ in 1938 and Daly Waters saw Australian and American air forces based here during WWII. 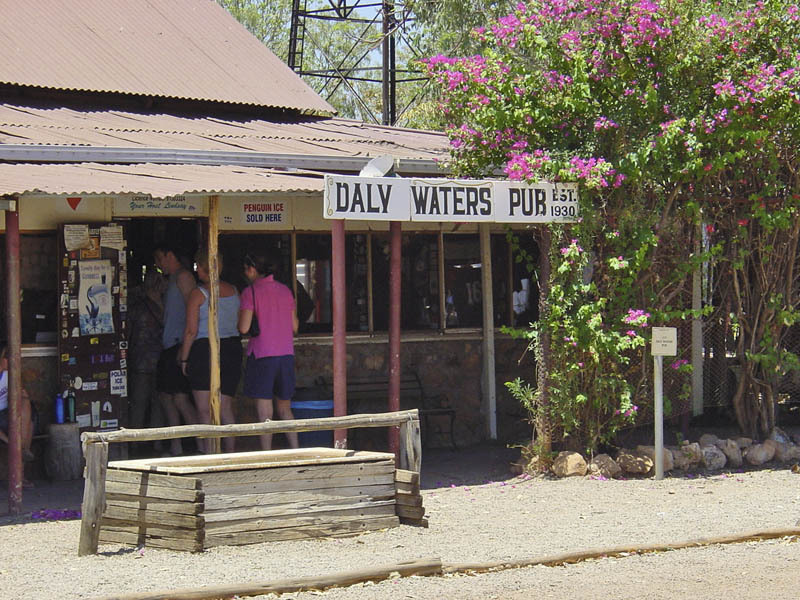 Daly Waters Hotel or Pub (as it is known today) remains one of the most unique ‘watering holes’ that the Territory has to offer. It is truly a welcome oasis with the water, cold drinks, warm food & warmer personalities. 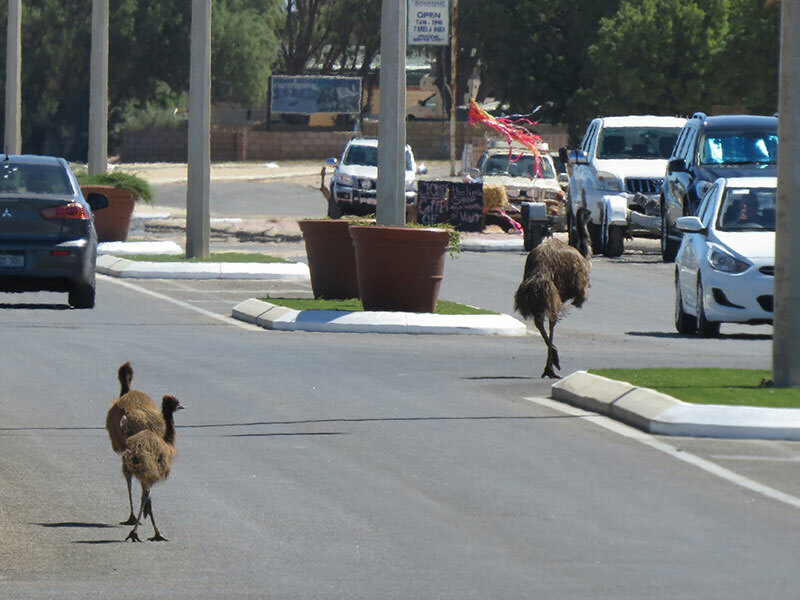 We are also treated to an amazing atmosphere where your eyes dance with the joy of discovery at every turn & ‘the loneliest set of traffic lights in Australia’. 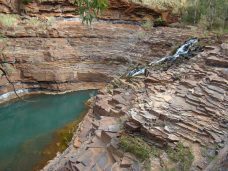 Daly Waters is certainly a space to be felt, a sight to see, an oasis to rest and ‘be watered’ in and another unique place to just be. Darwin, “The Top End”, fun and adventure. 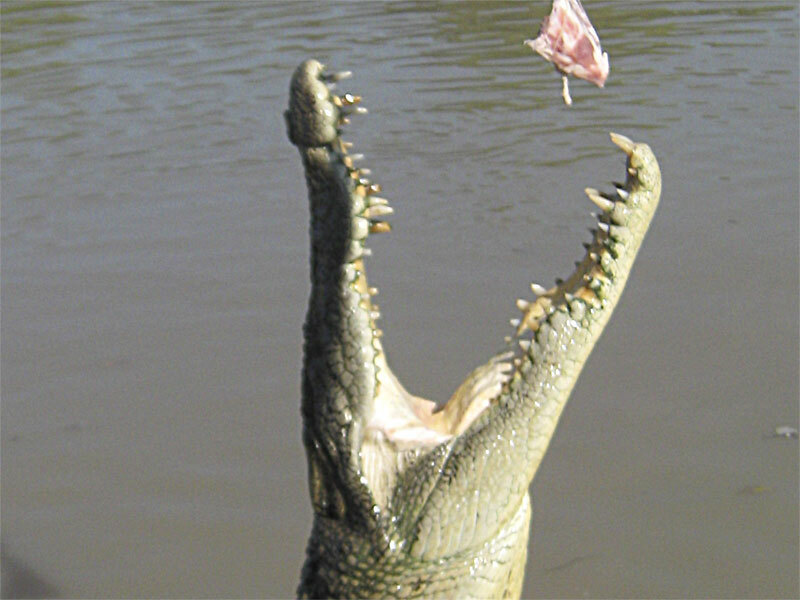 It is the big country town where you can let your hair down – the crocodile capital. 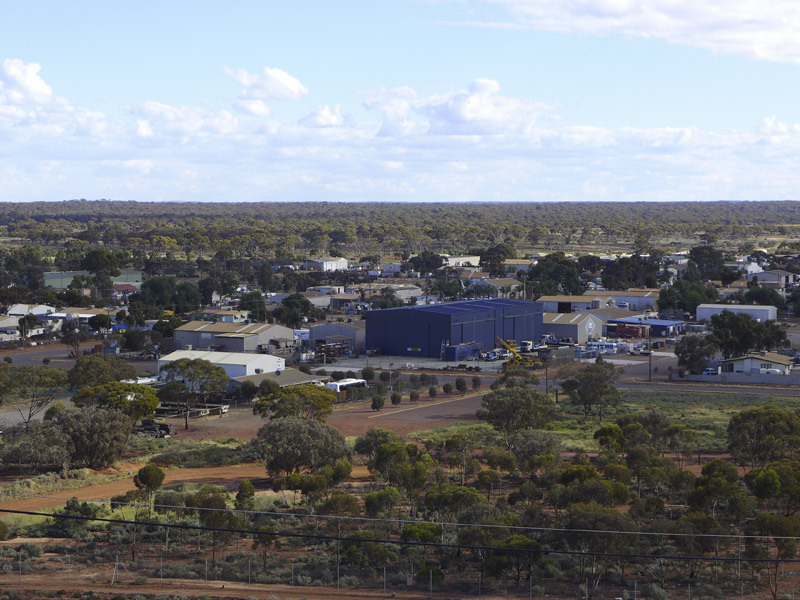 A town that holds many stories and not a day goes by when more are in the process of being told. 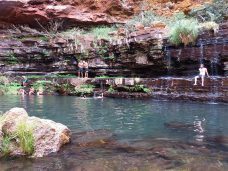 It is a place where people come to from miles away in search of the elusive Barra’ in the local creeks and streams, much like prospectors panning for gold. 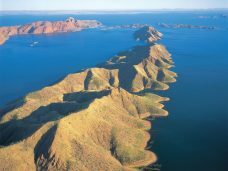 The northern city of this great island we call Australia. 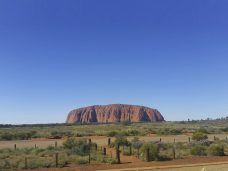 Imagine what it would have been like to live in a place like this in a time before all you see now was created, back in the day where people didn’t have power steering or air con’. 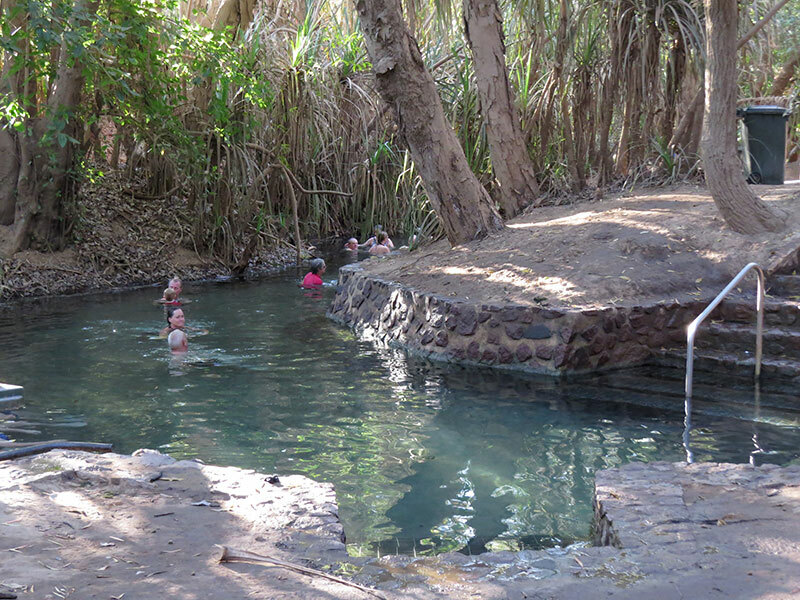 The temperature was only one setting and that was the heat of the day. 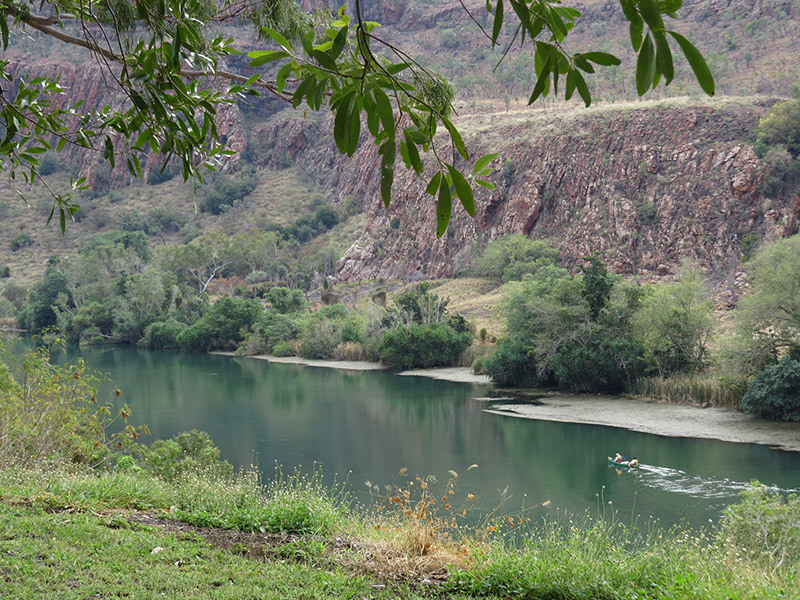 People lived with the land, moved with the breeze and had a simple understanding of the world around them. 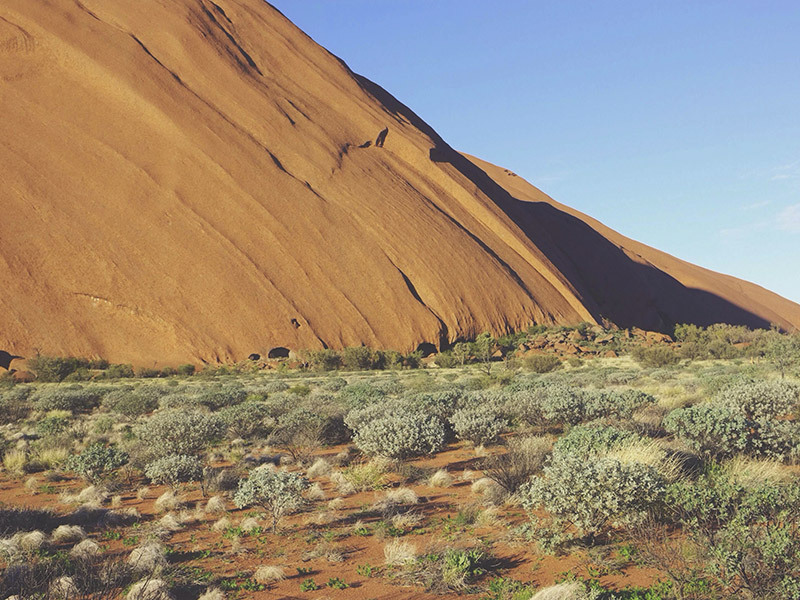 It makes you think… what is it that you want and what is it that you need? 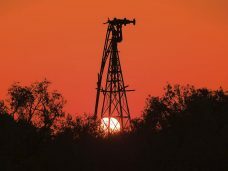 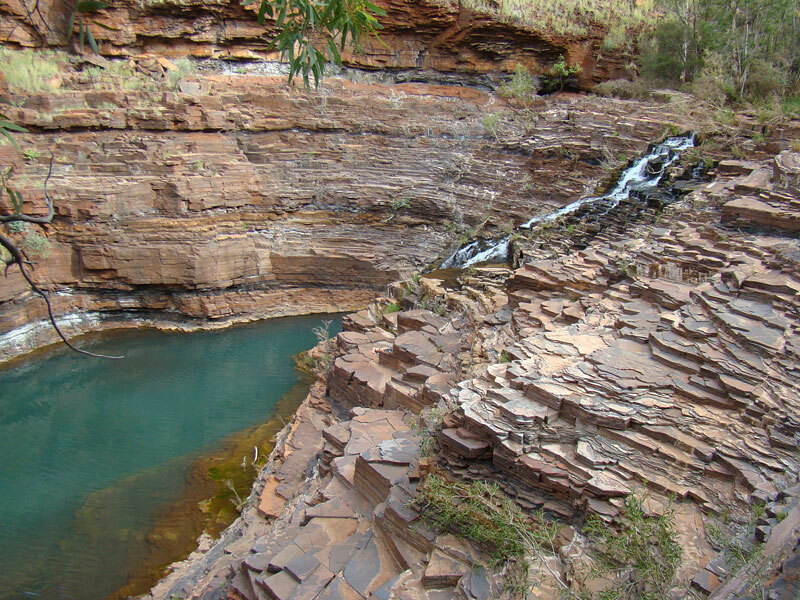 Derby was the first gazetted area in the Kimberley region. 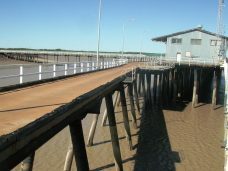 With it’s town and port established in 1883 it was a place to dock for ships supplying the Kimberly region, with stores and supplies for the cattle & sheep industries, people coming there for supplies could often take three weeks or more to complete their journey in a cart pulled by horse or donkey. 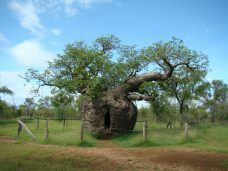 In and around Derby you can still see various aspects of it’s history when visiting iconic sites such as the Prison Boab tree (which actually used to hold prisoners) and the watering troughs that were used for cattle when bringing them in for shipping at the long circular jetty – also a good place to try your luck for a feed of fish! 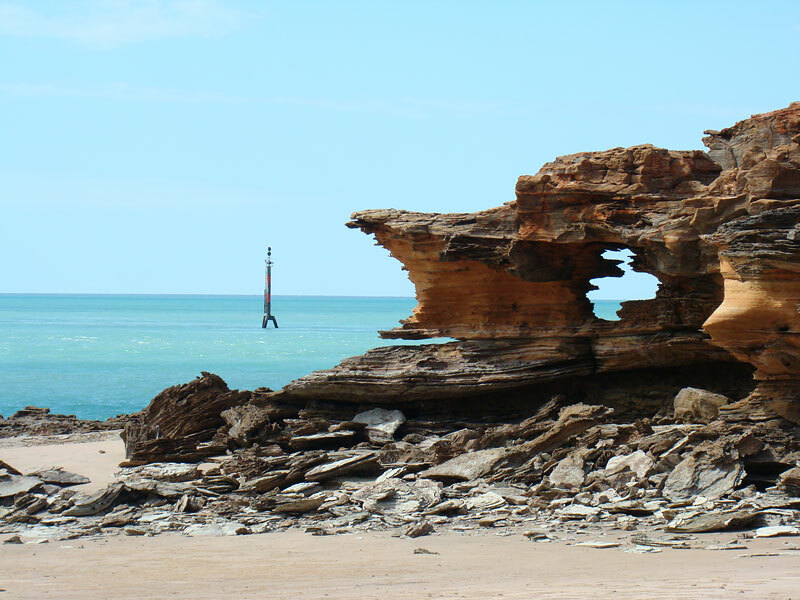 When leaving Broome and heading up to Derby (or vice versa!) 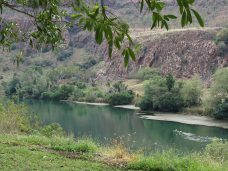 it is remarkable how the landscape around you changes, with the trees and other vegetation showing just how much of a difference a drink of rain can make to the land that they stand on. 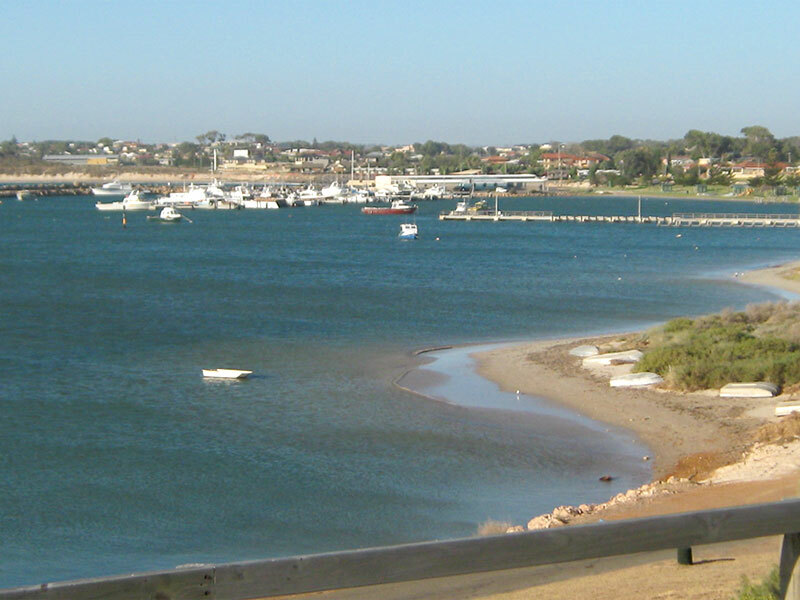 Dongara and Port Denison are two of the more prominent fishing towns along this stretch of the coast. 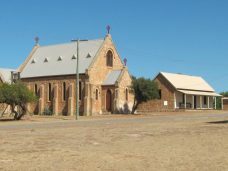 With a mix of rural farming and coastal living these towns are the origin point of the convict settled farming districts. 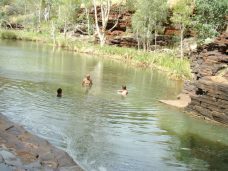 The Gibb River Road stretches over 655kms of rough, unsealed terrain from Derby to the East intersection where you must turn off to either Wyndham or Kununurra. Originally a cattle stock route and a link to Derby for pastoralists and formally known as Mt. 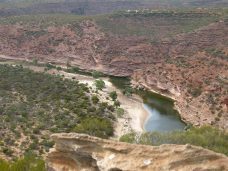 House road, passing Windjana Gorge, Carpenters Gap, and Whisky Crossing, the round trip from Mt. House to Derby would take roughly a month to travel . The original road was constructed by hand with pick and shovels clearing a path to make a track wide enough for bullock and cart to pass. In 1961 Main Roads started upgrading the Mt. 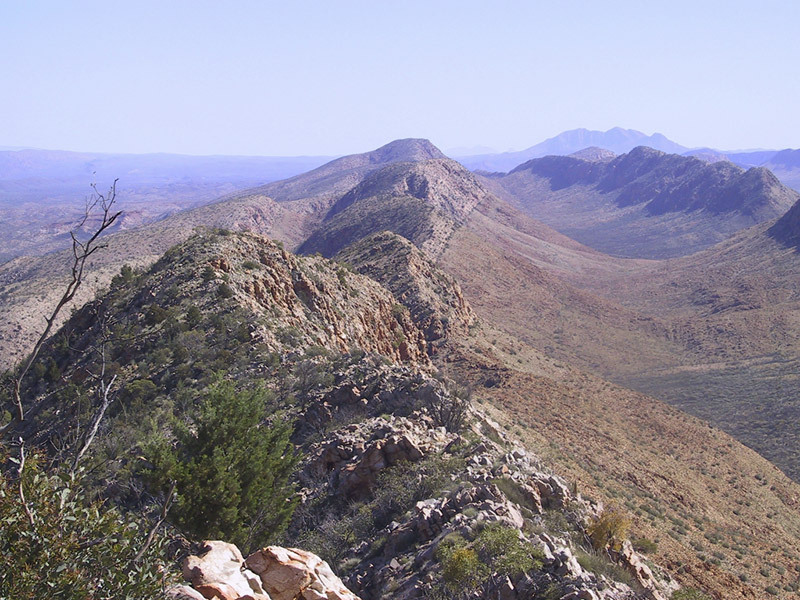 House Road and by the end of 1962 they had reached the King Leopold Ranges. 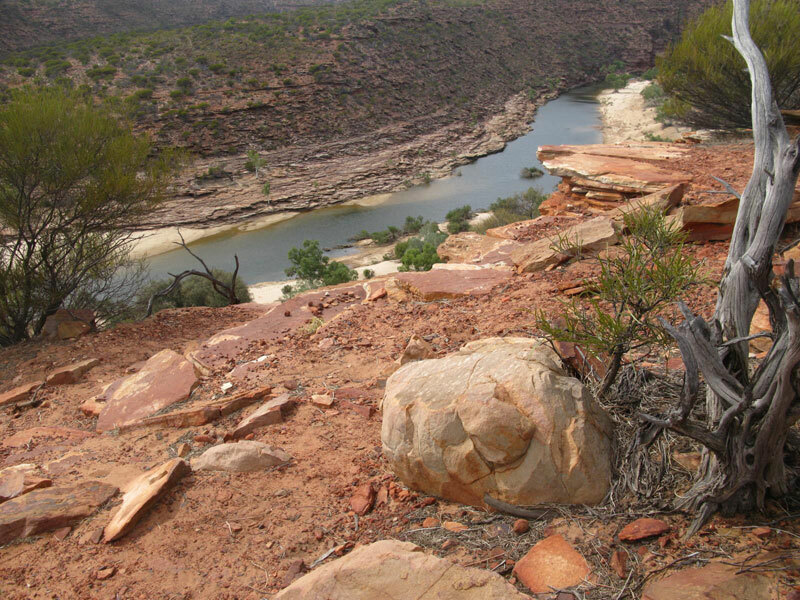 Continuing work on the road they had reached the Gibb River by 1965 and the road was then renamed Gibb River Road. 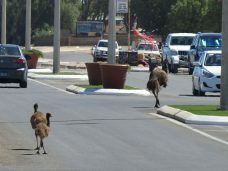 Finally, further road works linked the road with Wyndham to the East. 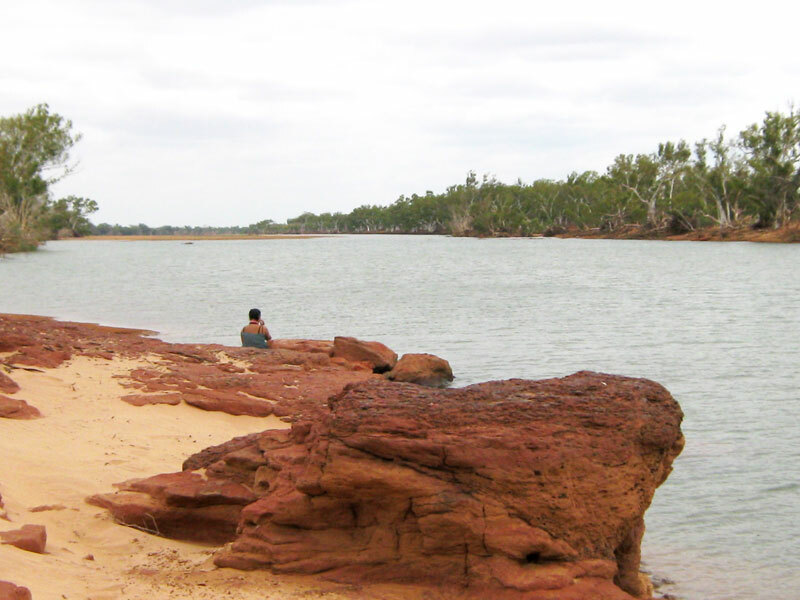 On our journey we won’t be travelling all 655kms of the Gibb River Road. Instead we will be turning off and travelling down to Windjana Gorge and Tunnel Creek, back to Great Northern Hwy. 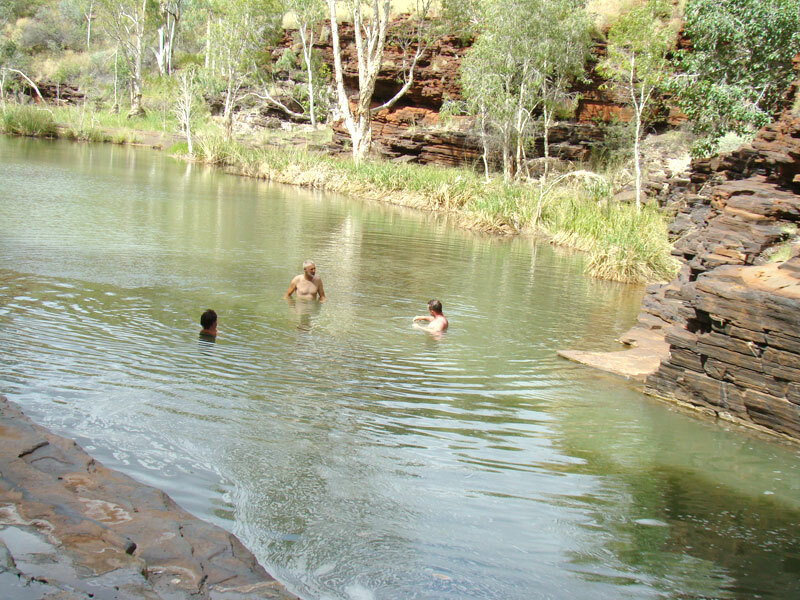 and Fitzroy Crossing, stopping off at Geikie Gorge on our way to the Bungles. The original inhabitants, who walked, lived and respected the area held beliefs and stories that connected them to the land. 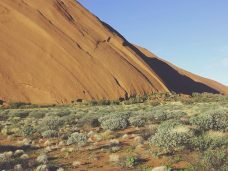 Their way of life and beliefs have been preserved and are still present as we journey through this ancient, and somehow ageless landscape, reflecting on our own life’s journey and the path we are travelling on. 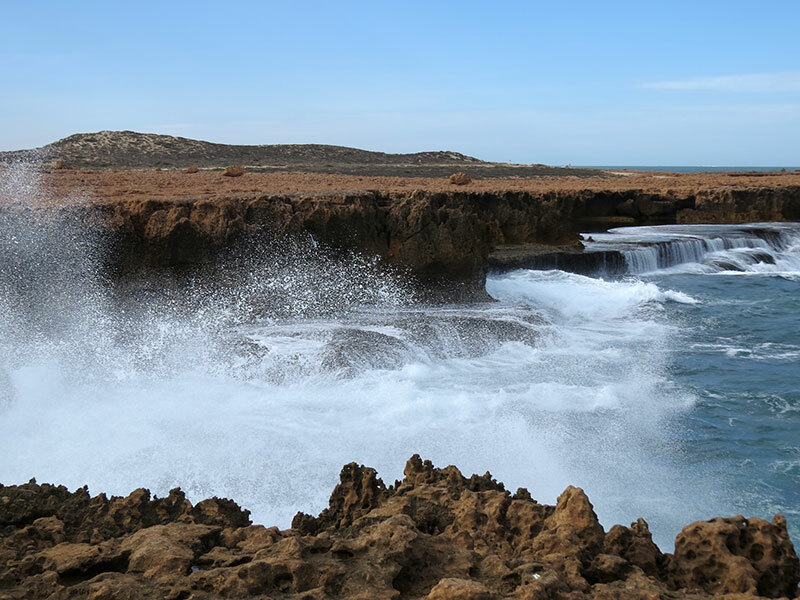 The history of Greenough, Geraldton and the Batavia Coast is a story of mutiny, deceit, bloodshed and murder – an adventurer’s courage travelling into the unknown. It began in 1628 with a newly built ship called the Batavia, destined to search for spices for the Dutch East Indian trade company of Amsterdam. 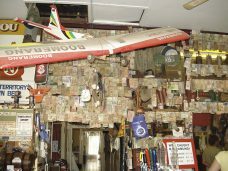 After leaving Cape Town, the Batavia, with a compliment of 322 people and it’s cargo of gold and silver for trading was in trouble. Some of the crew members had plotted a scheme for mutiny so that they may start a new life on the riches of the Batavia. 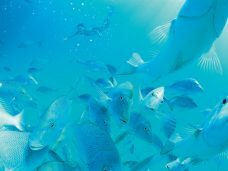 During the night, whilst the captain and other crew members were asleep, the ship was commandeered and veered off course away from the rest of the fleet so that no one would overhear their uprising. 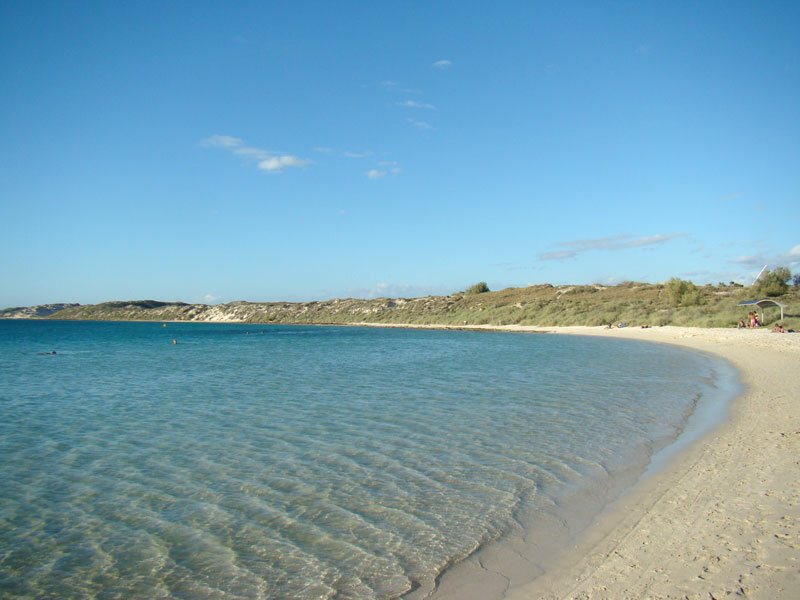 This act led them to the Australian mainland off the coast now known as Geraldton, where they ran into submerged reefs and a small group of islands (the Abrolhos Islands). 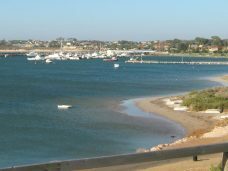 The mutinous crew members slaughtered the men, women and children of the Batavia and formed Australia’s first European settlement in 1629. 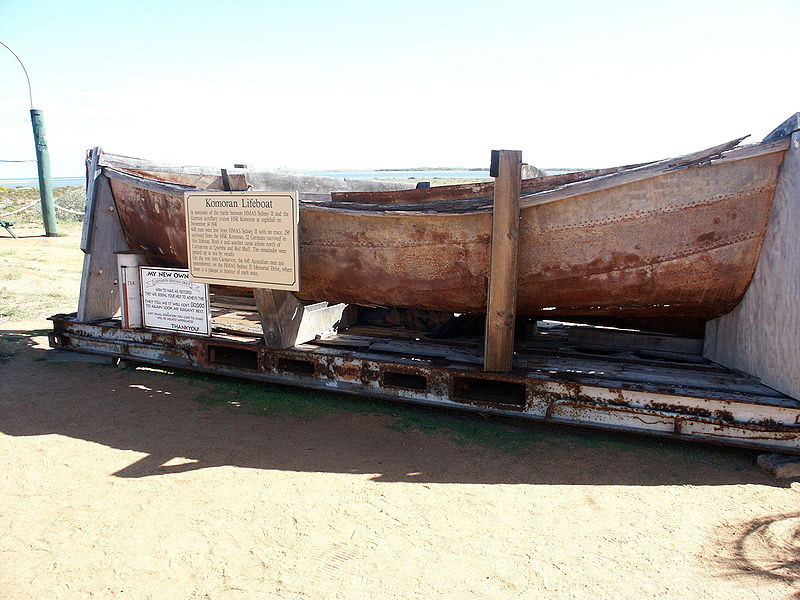 The final resting place of the Batavia remained undiscovered until 1963 when a rock lobster fisherman stumbled upon the ship’s anchor while setting his pots. The fate of the Batavia remains as one of the most gruesome acts in Australia’s history and makes for a great book read! 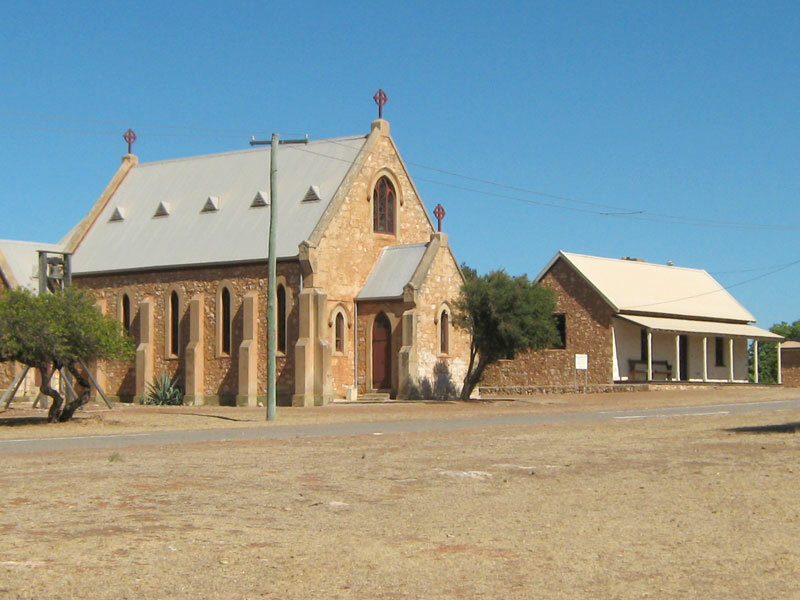 The township of Greenough is located 24kms south of Geraldton and was founded by George Gray in 1839. 12 years later, in 1851, 300 thousand acres were surveyed by Augusta Gregory and made into smaller farming lots to encourage English settlers to come and farm the land. 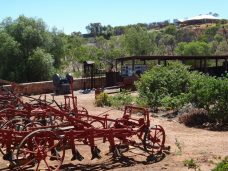 Greenough Flats became a highly successful wheat growing area, and with the considerable help of convict labour, became a thriving community. 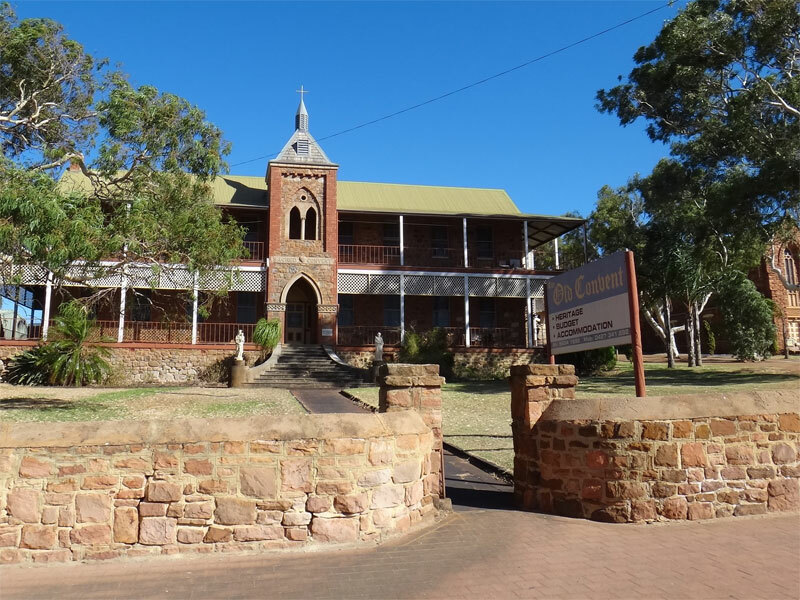 Today, the buildings of the past have been preserved and restored so as to give some insight to what life would have been like back then. 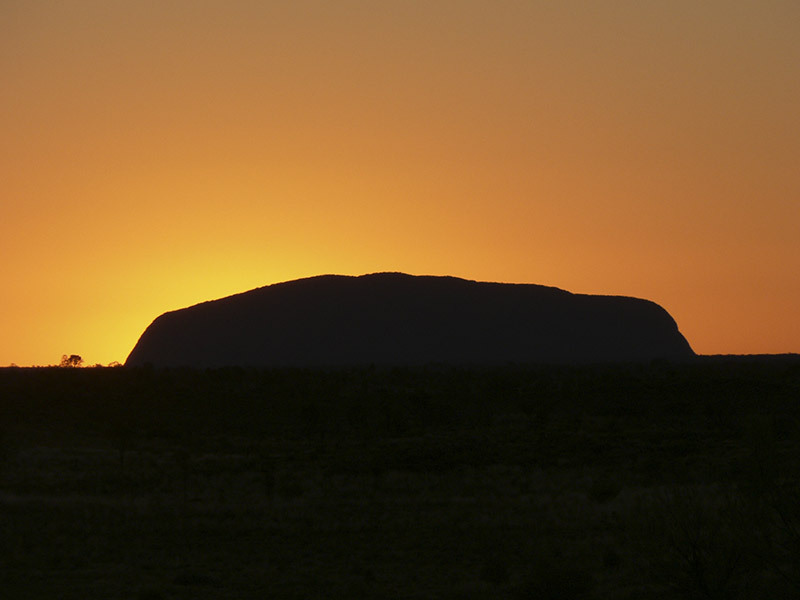 It can give perspective and help us appreciate the things we take for granted today. 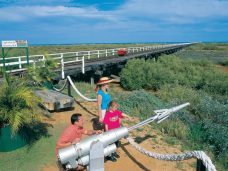 Geraldton, the modern big country town, was first made popular back in the late 1840’s with the discovery of lead in the Murchison River. 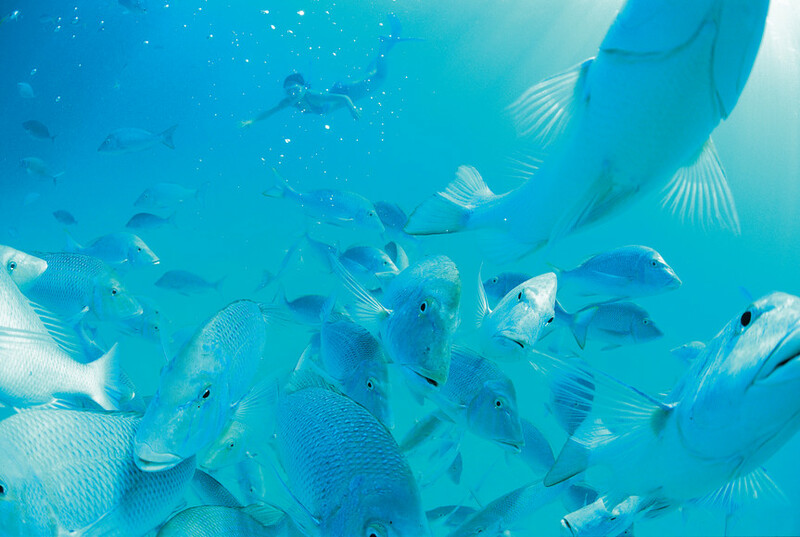 As time progressed the fishing industry opened up and so did the farming industry. 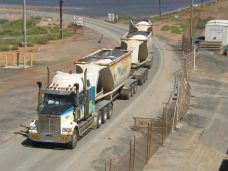 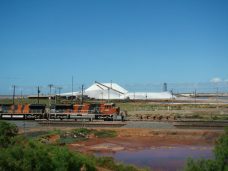 With the establishment of a major port, Geraldton has become a major pick up point for the export of grain as well as the minerals from the mining sector. Geraldton also holds a memorial on top of Mount Scott in remembrance of the HMAS Sydney that was sunk in battle off the coast of Monkey Mia in World War II by the German battleship Kormoran. 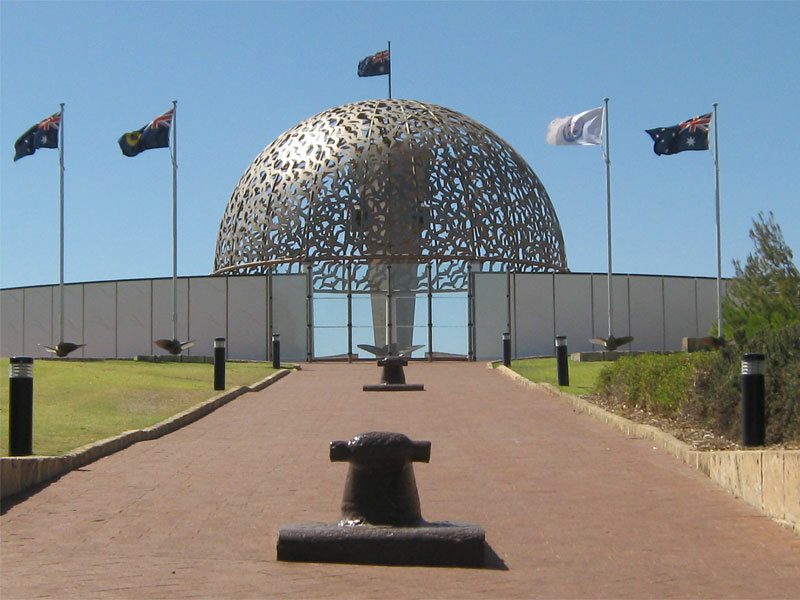 Survivors of the Kormoran were taken to prisoner of war camps – none of the 645 sailors from the Sydney survived the encounter. 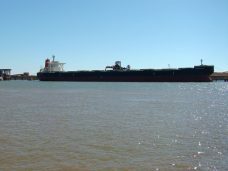 The final resting place of the two battleships remained a mystery until they were recently discovered in 2008. 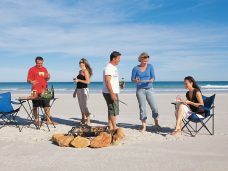 Greenough and Geraldton are known for their sea breezes and you will be able to see just how much it can blow by the way some of the region’s tree species have grown more off to the side than upwards. 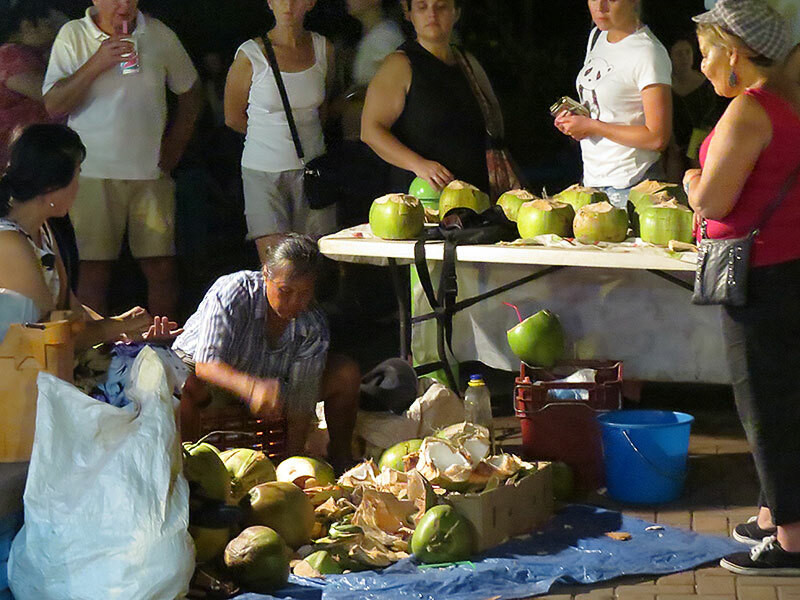 Imagine how easy pickin’ would be if they were fruit trees! 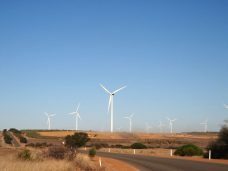 There are over 54 wind turbines in the area, each soaring at 80 meters tall. 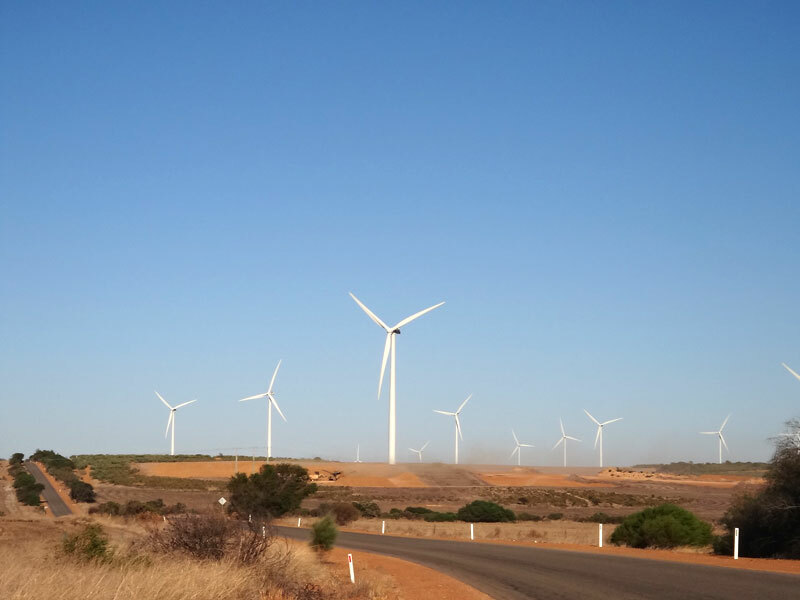 Together they generate enough power to meet the energy demands of up to 60 thousand homes. The Pinnacles, made by the winds of time, stand to tell the story of thousands of years of sand brought in by waves from the sea. 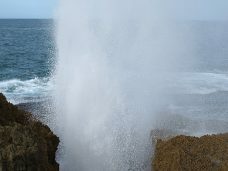 A Gazillion grains of sand particles, comprised of quartz, weathering rock and delivered to the ocean by rivers, and broken particles of shell compressed with plant matter that grew on top. 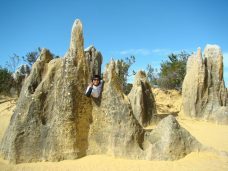 Acid was released from the plant matter forming calcrete on the softer limestone and getting in to crevasses of what once were the root systems of the plants that once existed, hardening the soil and leaving the loose soil to be swept away by pervasive winds – Thus leaving sculptures from nature. 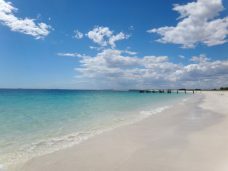 Jurien Bay was first acknowledged by early explorers in the 17th century and were named after Charles Jurien of the French naval administration. 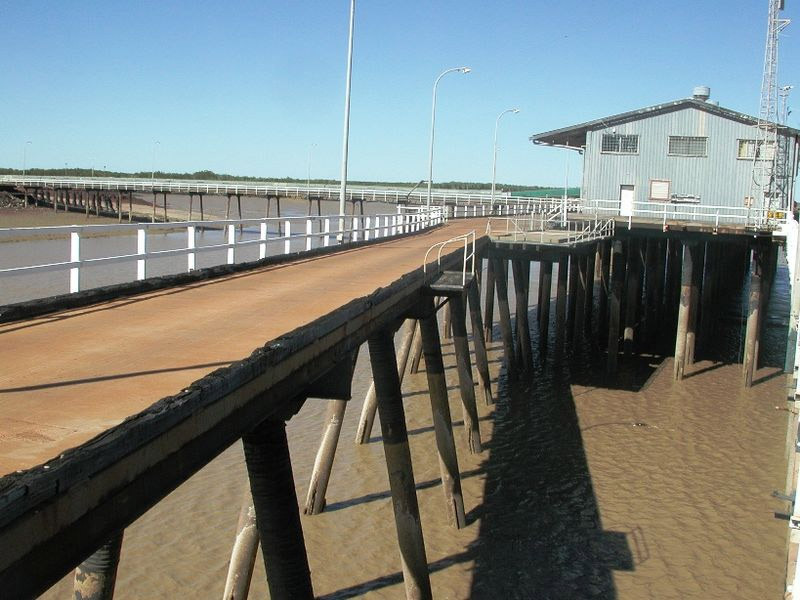 Walter Padbury was the first settler to establish a pastoral grazing settlement and with this agricultural success a jetty was constructed for the convenience of the supply boats. 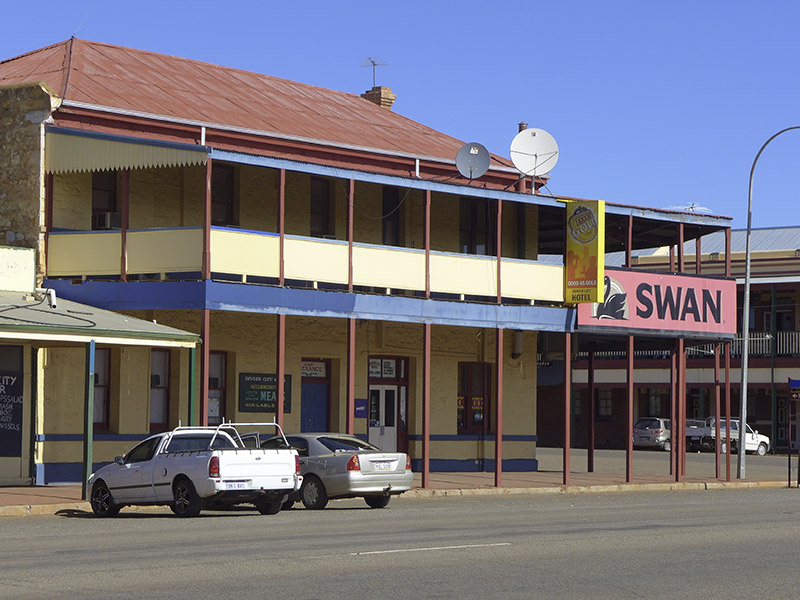 Soon this small town started to flourish. 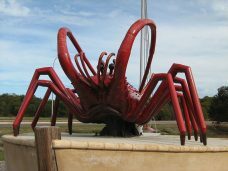 Today Jurien Bay and it’s neighbouring fishing towns have expanded and grown into life-style holiday destinations in their own right, with cray fishing (rock lobster) and fishing in general being one of the main industries undertaken. 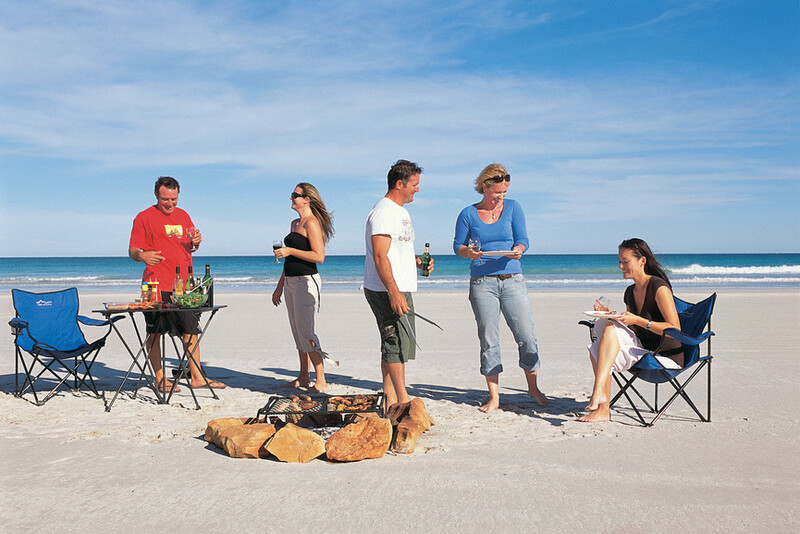 The parks & BBQ facilities and white sandy beaches help make visiting these towns a relaxing and peaceful experience. Relax and unwind. 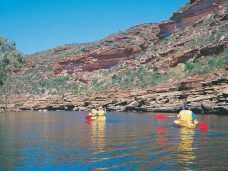 Kalbarri, where the mouth of the Murchison River runs into the sea , a paradise for the holiday maker, with many varied activities to make the stay more pleasurable and exciting – surfing, kayaking, sailing, bush walking, abseiling, fishing, whale watching (when in season), and skydiving. 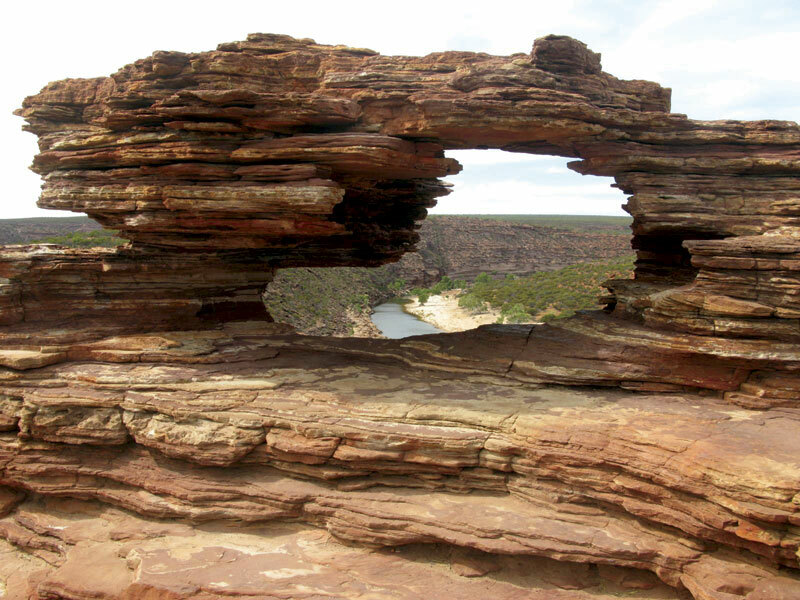 And if skydiving is too much, nature’s show of rock formations, flora and fauna can bring you back to earth. 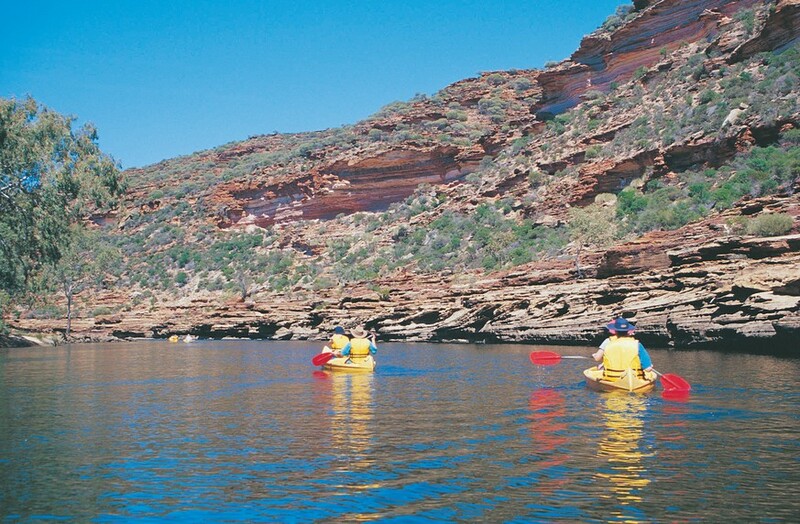 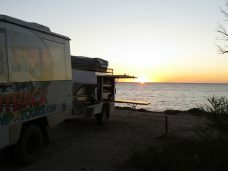 Kalbarri is another great place to “chill out and take things in”. 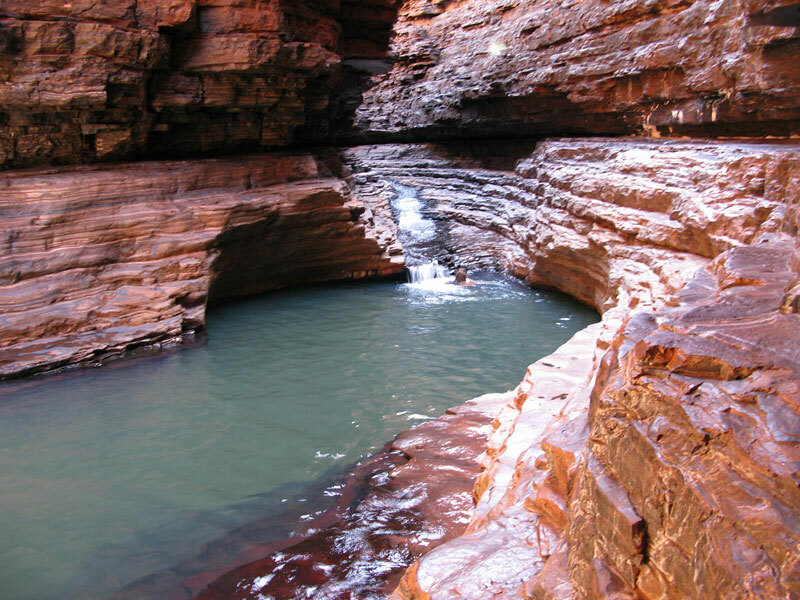 Karijini National Park is a dry and rugged destination, a place shaped and formed by the passage of time. With hidden beauty and spectacular views, one can experience a feeling of empowerment when standing on the edge of the gorge and taking in it’s splendour – making the journey to it so worthwhile. 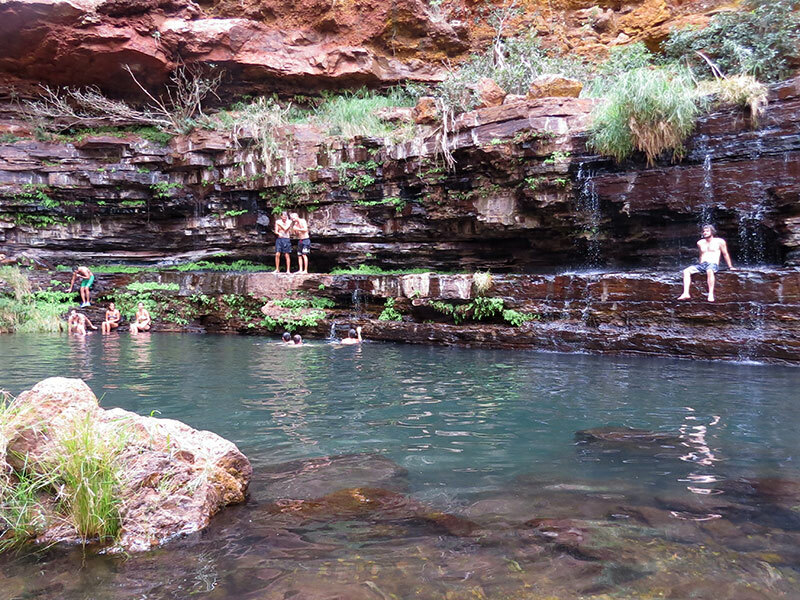 Enjoy bush walking around to the look-outs and down into the gorges to be rewarded with a cool swim. 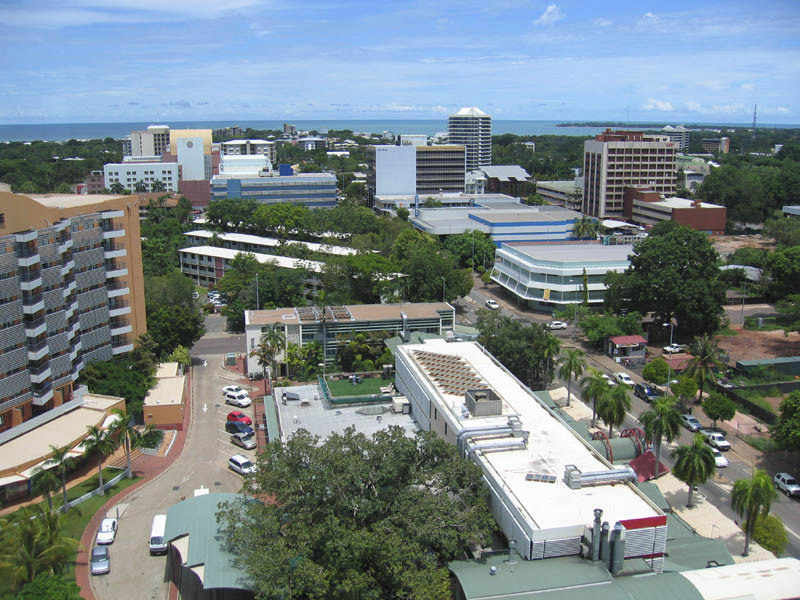 Katherine is the intersection of the North, with roads leading to it from each point of the compass. 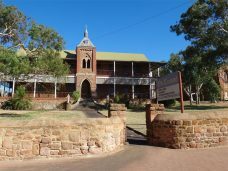 Originally Katherine was set up in 1872 as a telegraph station with lines running from Adelaide in South Australia all the way to Darwin in the Northern Territory. Explorer John McDouall Stuart, passing through in 1862, named the river “Katherine” on his way through to the North (Stuart Hwy. 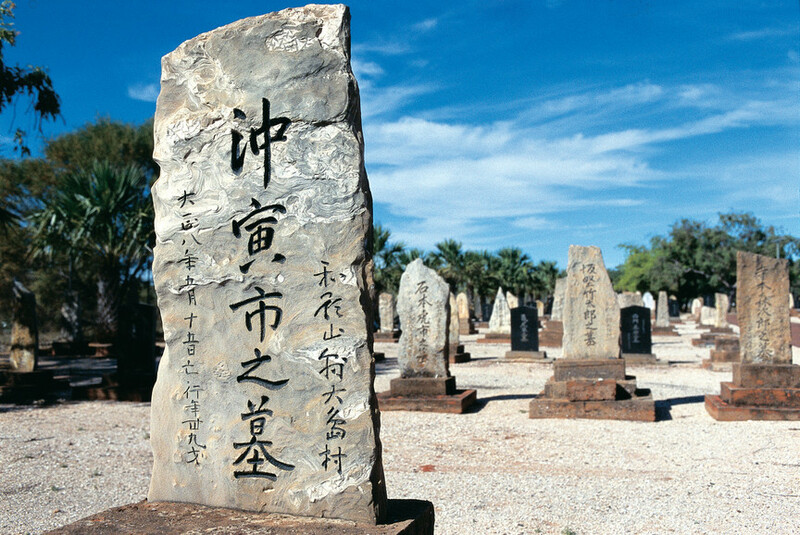 was named after him). 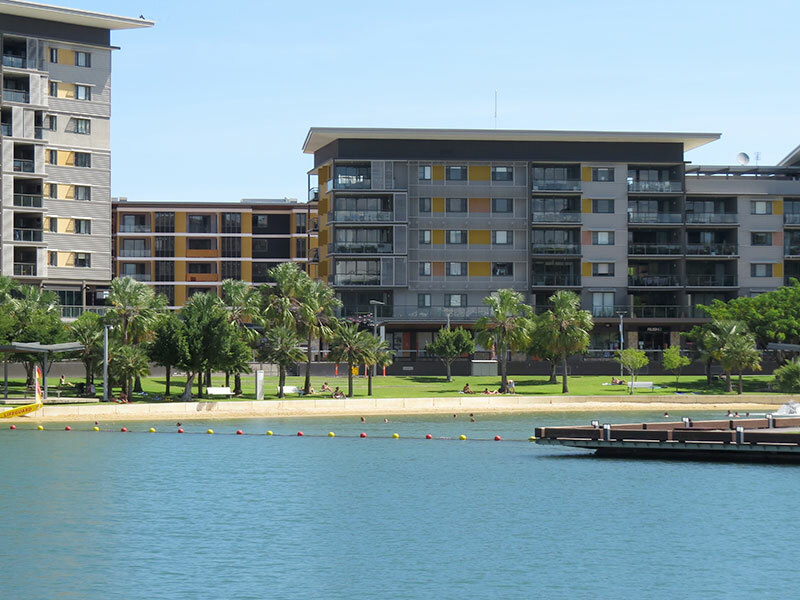 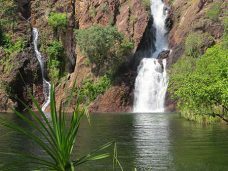 Katherine’s residents and township is supported by mining, cattle, military, agriculture, and tourism – the most popular tourist spots being the Nitmiluk National Park and Katherine Gorge as well as the crystal clear waters of the thermal springs. 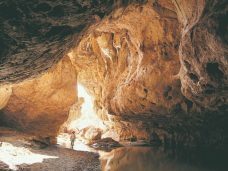 Others like to explore the local cave systems. 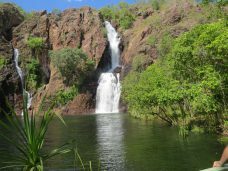 As we travel from Katherine and head to Darwin (or vice versa) we will often stop at Edith Falls for a cool swim, a stretch of the legs, and something to eat. Kununurra is Western Australia’s food bowl of the North. 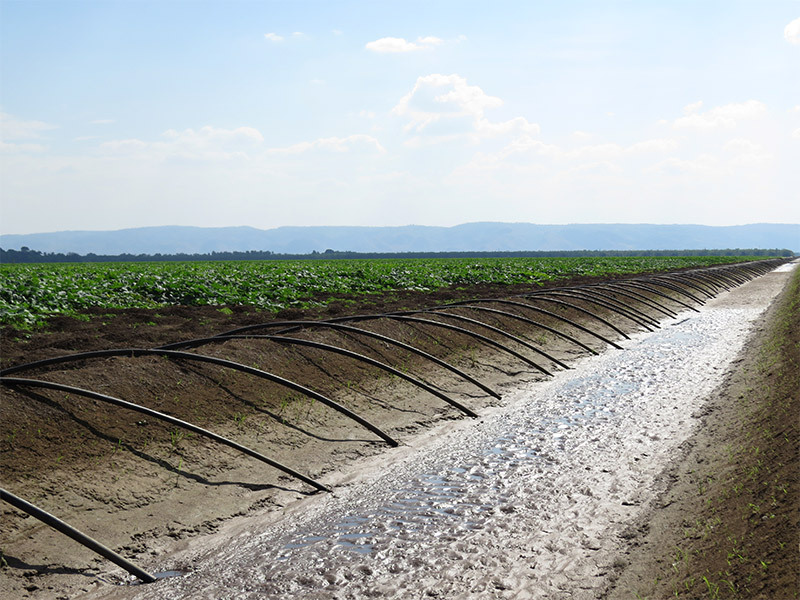 Once comprising of pastoral leased Ivanhoe Station, its loamy soil plains give the necessary nutrients to sustain a horticulture industry – including mangos, papaya, sugar cane, watermelons, rock melons, cotton, sun flowers and rice. 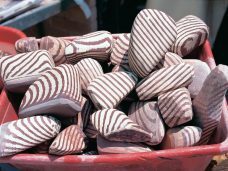 Recently there has been a focus on Indian Sandalwood as it is less labour intensive, is resistant to diseases and pests, and can fetch a more steady and reliable price. 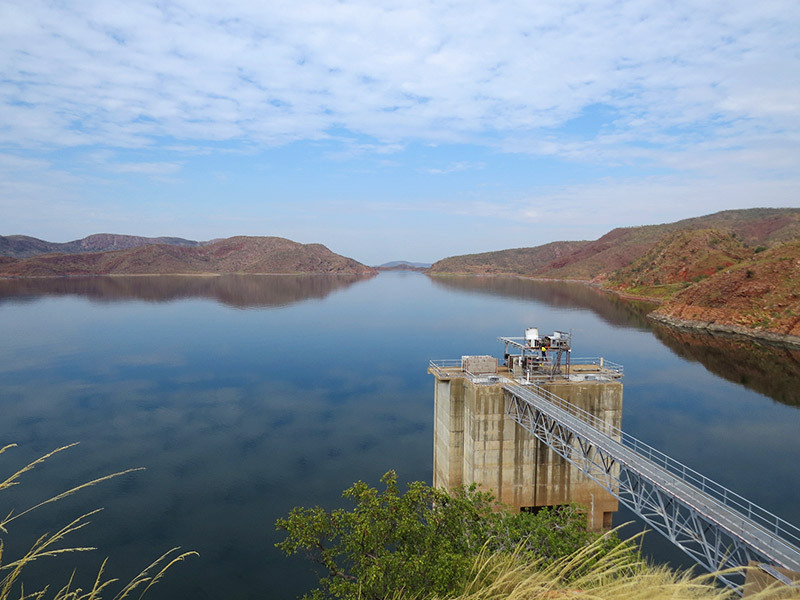 The Ord River Scheme controls an area big enough to contain over 18 Sydney Harbours, and supports a hydro power station that helps power the town. 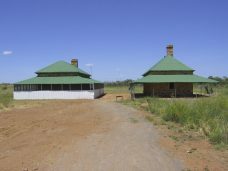 The town itself was built over another historical site, the Argyle Downs Station, a site pegged out and settled by the Durack Family from Queensland. 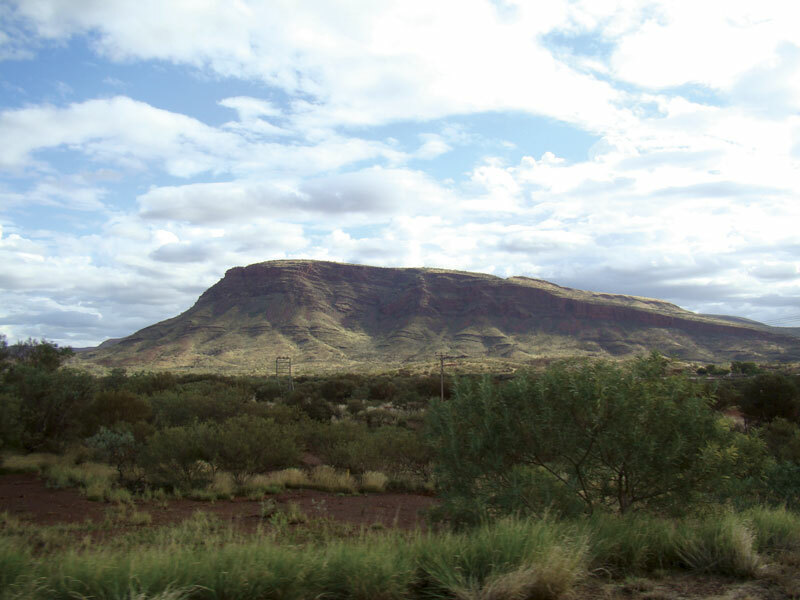 The Duracks took two and a half years to travel over from their home state in 1885 with 8000 head of cattle. 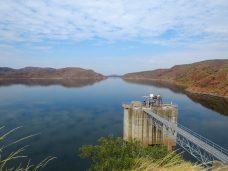 Later on their homestead was pulled down rock by rock and rebuilt on another site so that whole area could be flooded to make the body of water now known as Lake Argyle. 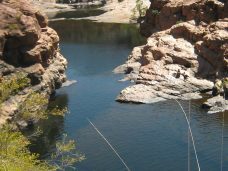 Kununurra and this part of the Kimberley Region hold other secrets such as the Argyle Diamond Mine, which produces 95% of the world’s supply of pink diamonds (a type of diamond that holds over 20 times the value of other diamonds and is rarely found in this mine let alone any other mine). 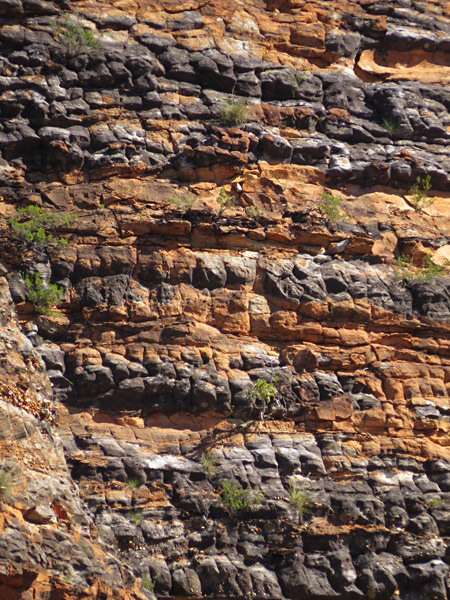 Another rare gem of the East Kimberley is the zebra rock, the only deposit found in the world. 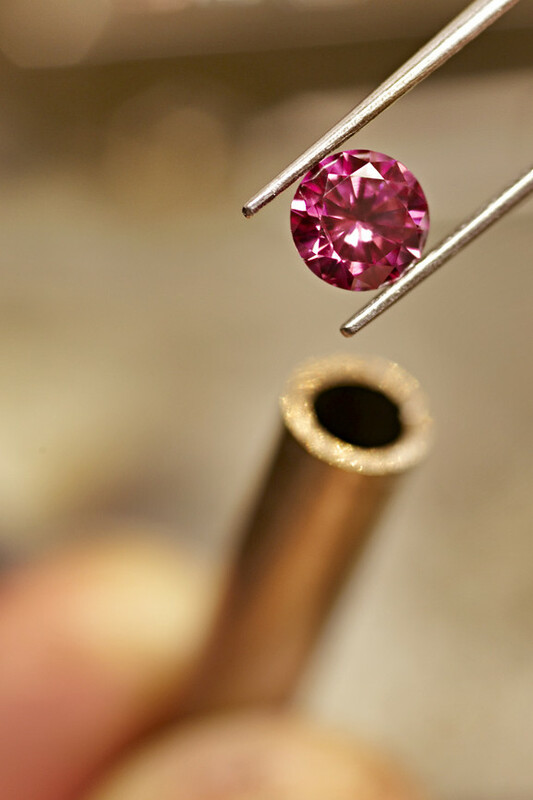 Not as highly prized as the diamond but still a beautiful phenomenon that dates back 600 million years. 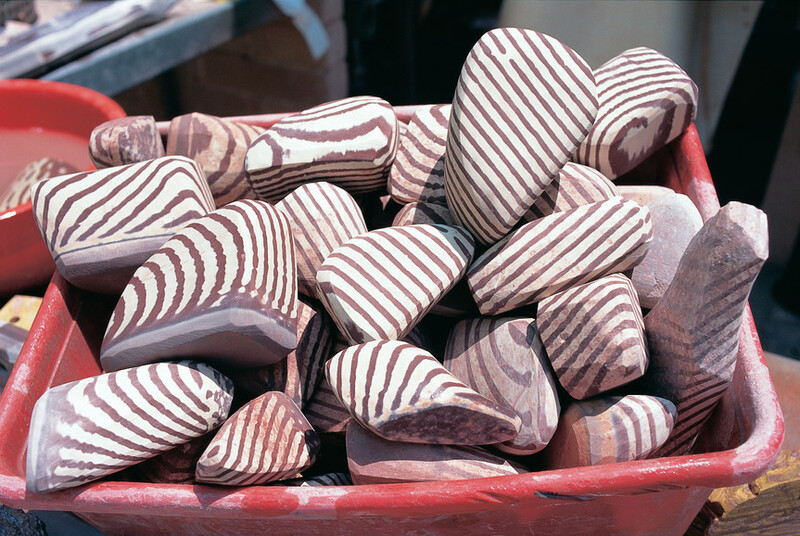 Scientists are still baffled as to how the sediment deposits formed the zebra-like pattern in the stone. 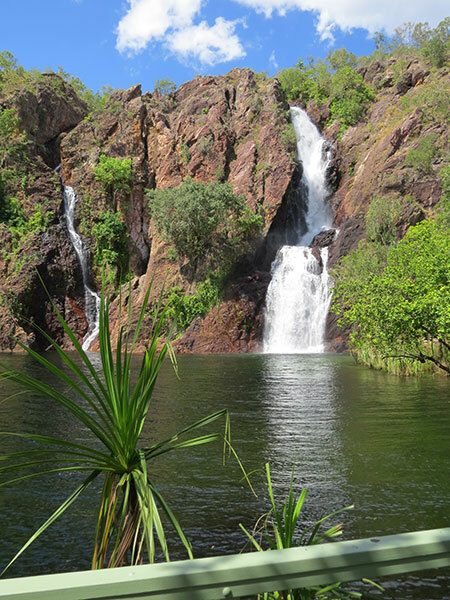 Litchfield National Park is a paradise amongst the waterfalls, some being quite secluded making them an effort to reach but at the same time well worth it. 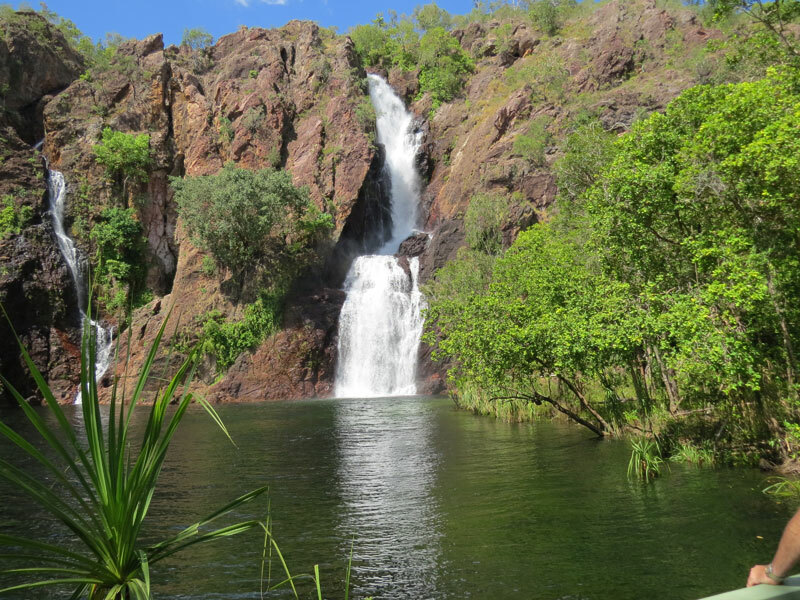 The waterfalls and the land surrounding the area hold meaning and significance to the Aboriginal people, as a place that provides food and water as well as a location for spiritual and cultural ceremonies. When we go there today we will get to experience the remarkable scenery and beauty that nature provides within a monsoonal rain forest, with its vines and creepers, palms and colourful trees, rocky outcrops, all while we cool off under a refreshing waterfall. 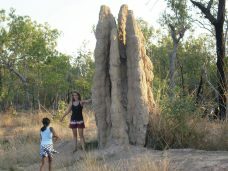 One of nature’s creatures that are found in abundance in the “top end” and Litchfield is the magnetic termite. 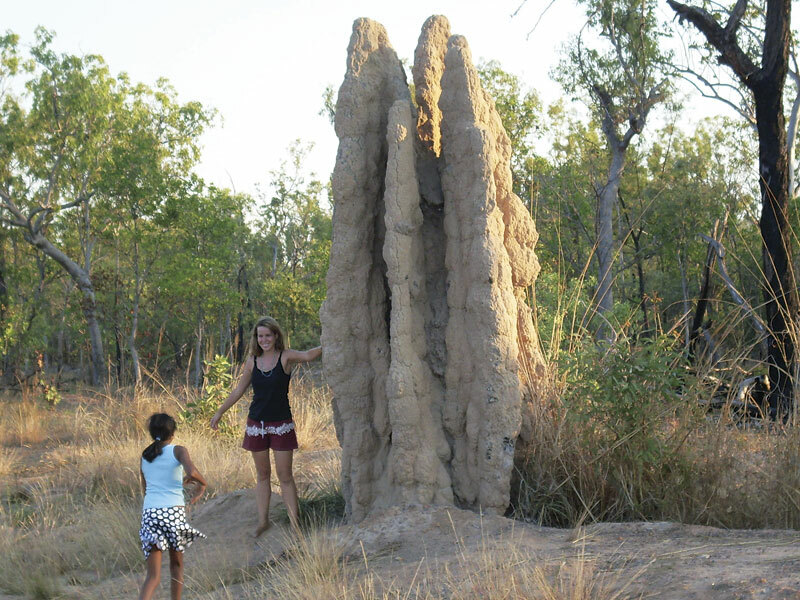 These insects make their homes out of mud, grass and other organic matter, building them on a north/south angle so as to help control the temperature within the nest. 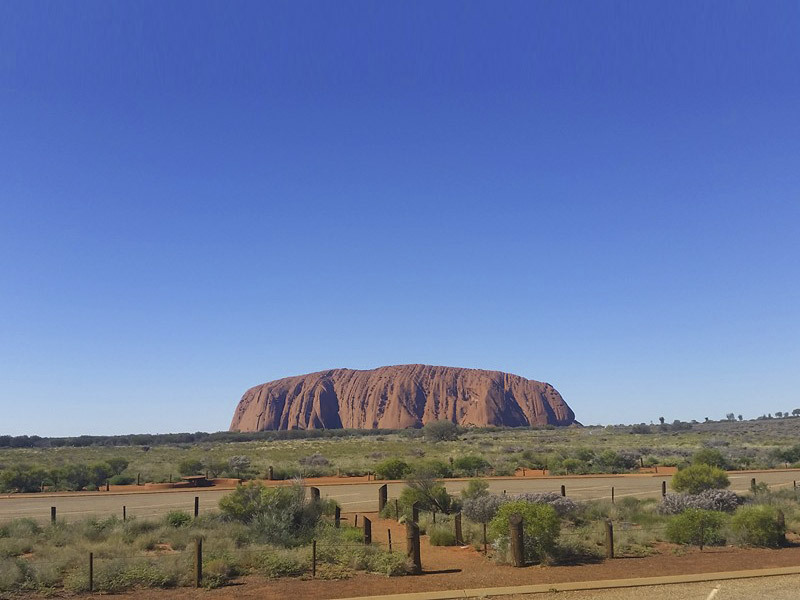 Some of these constructions reach a height of over 5 metres making them expensive real estate from the termite’s point of view – from their perspective they could see for miles! 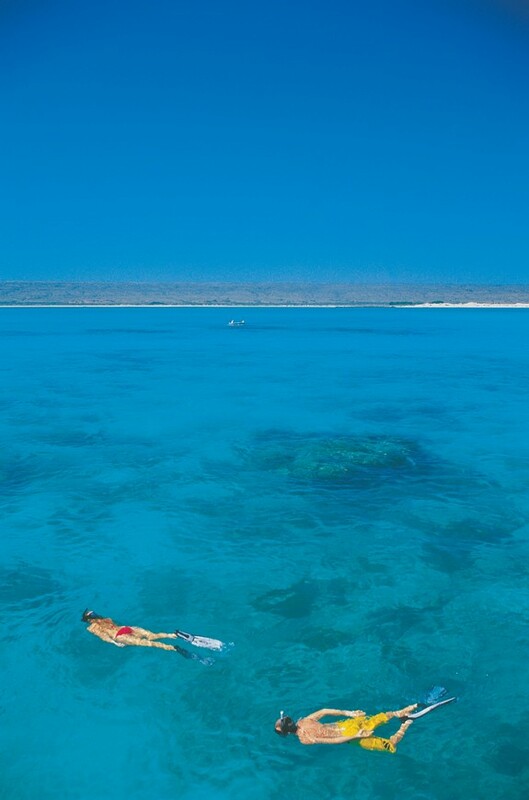 Coral Bay & Ningaloo Reef are a wonderland for snorkelers and divers who wish to swim amongst a living coral reef and it’s wide array of fish, including the largest of them all – the whale shark. 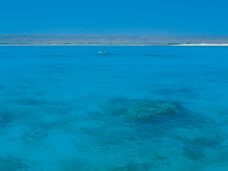 Depending on the season, tours can take you out to swim, snorkel, or just gaze through a glass bottomed boat to experience this hidden, unspoilt secret of the West Coast. 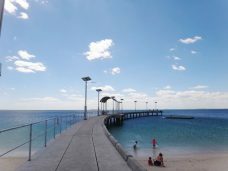 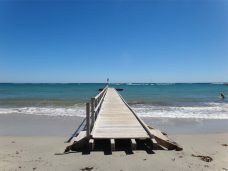 Alternately, just enjoy a peaceful stroll along the beach, taking in the atmosphere and cooling off with a swim in the crystal clear waters, to then lie down and absorb the sun’s rays. You could try your luck at catchin’ a fish or going on a quad bike tour, or any other activity that may scratch your adventurous itch! 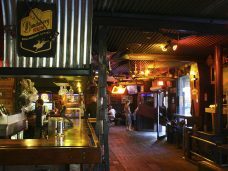 Northampton is a country town where you can still feel the country hospitality and slower pace of the farming community. 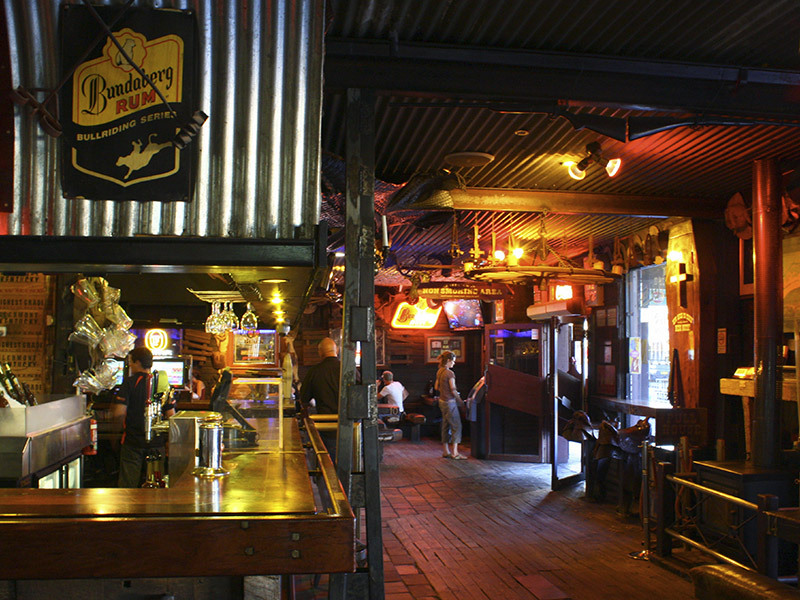 A place where people gather at the pub to catch up and have a yarn over a few beers, discussing what was and what could be, and having a laugh when there’s “nothin’ you can do about it”. 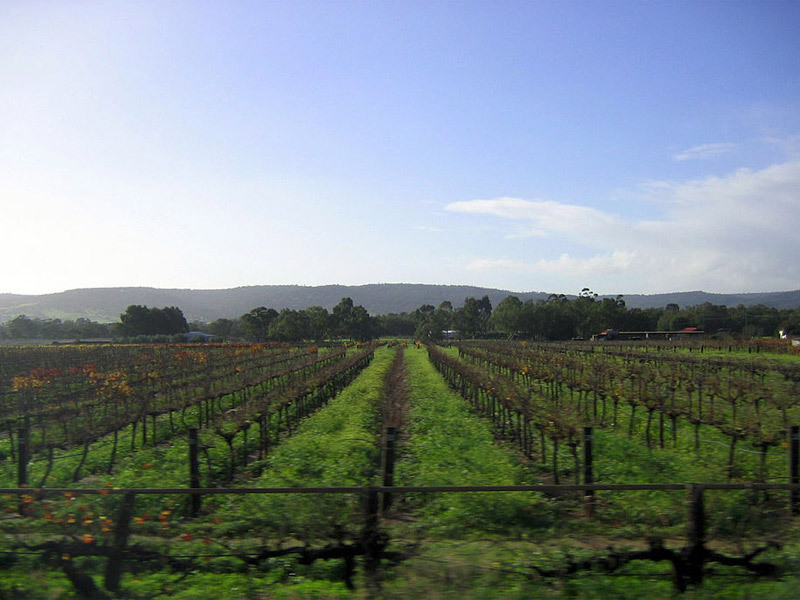 Settled in 1829 by Captain James Stirling, this area is renowned for it’s rich, fertile soils that produce some of Australia’s finest wines and tastiest fruits. 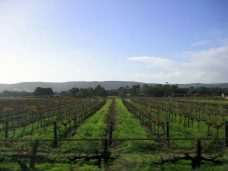 In more recent years the Swan Valley has become home to small boutique restaurants, chocolate & candy stores, and micro-breweries in amongst long established family owned vineyards and wineries. 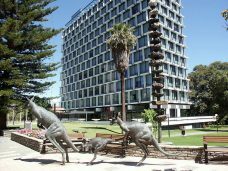 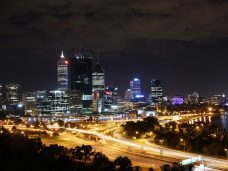 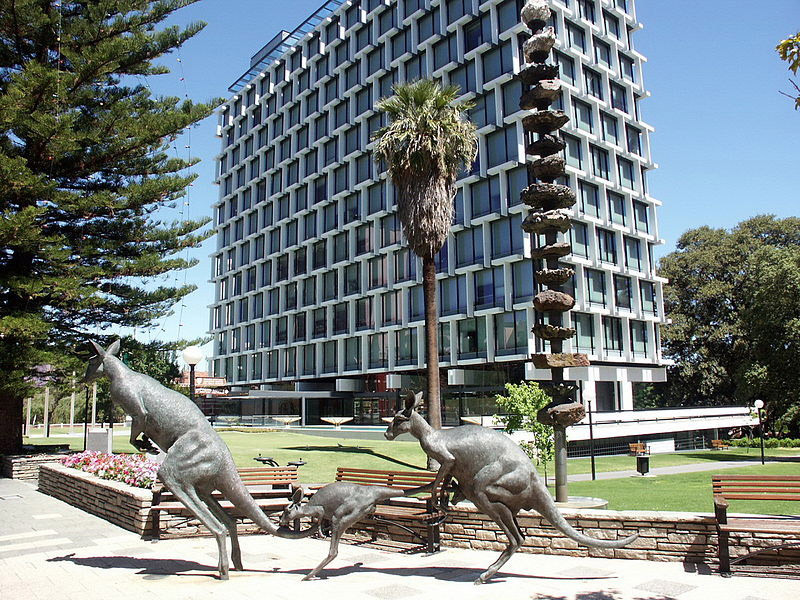 Perth itself has changed over time to become the modern multi-cultural city you see today, but you can still sense it’s history in some of the local people and the “horse & cart” pace of everyday activity that hint to the times of it’s settlement. 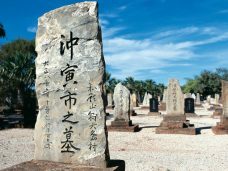 It is important not to disregard the history before the horse & cart too. 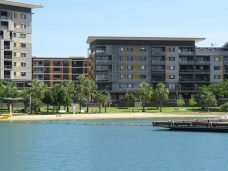 Not to disregard the Aborigines who knew how to live their lives in a balanced way, living, walking and co-existing with the environment. 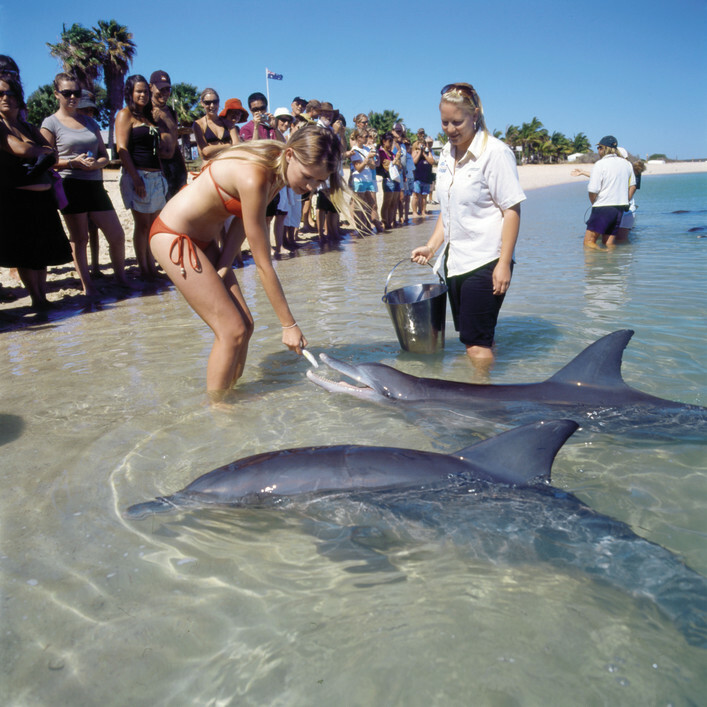 They understood back then what could happen to our fragile eco system if nature’s boundaries were broken. 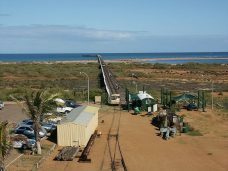 Port Hedland, one of Western Australia’s main shipping arteries, dealing in red dust and dirt, flowing in by train on the railway from many directions, like blood pumping through veins. 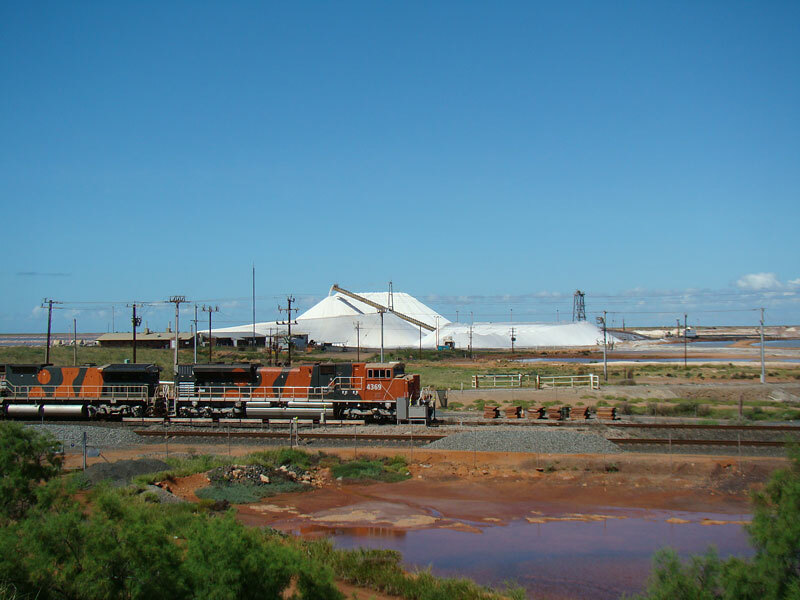 These trains fully loaded are pulling roughly 29,500 tonnes of iron ore and can stretch out to 2.4kms long – just enough time to have your lunch if you had to stop and wait at a railway crossing! It takes roughly 28hrs for a train to leave and make a return trip to the mine. 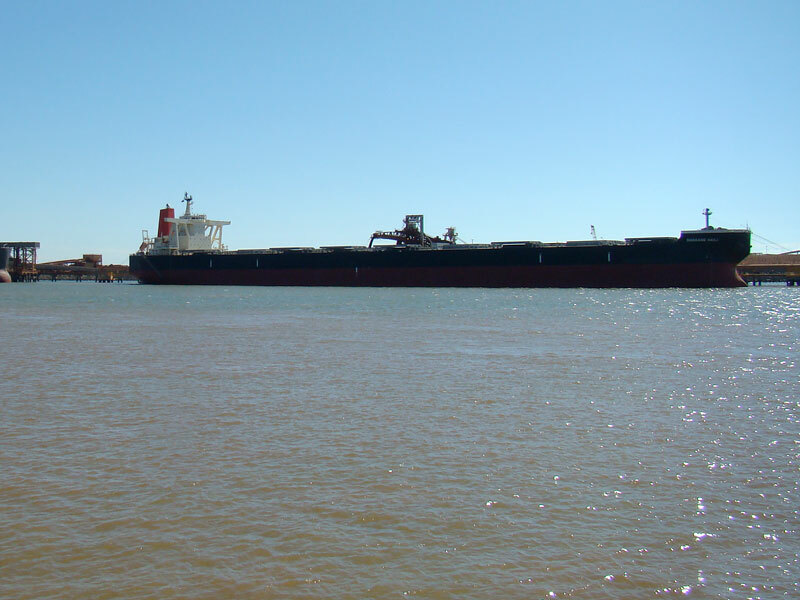 Back “in the day” the first ship leavin’ Port Hedland heading for Japan was loaded with 24,900 tonnes of cargo. 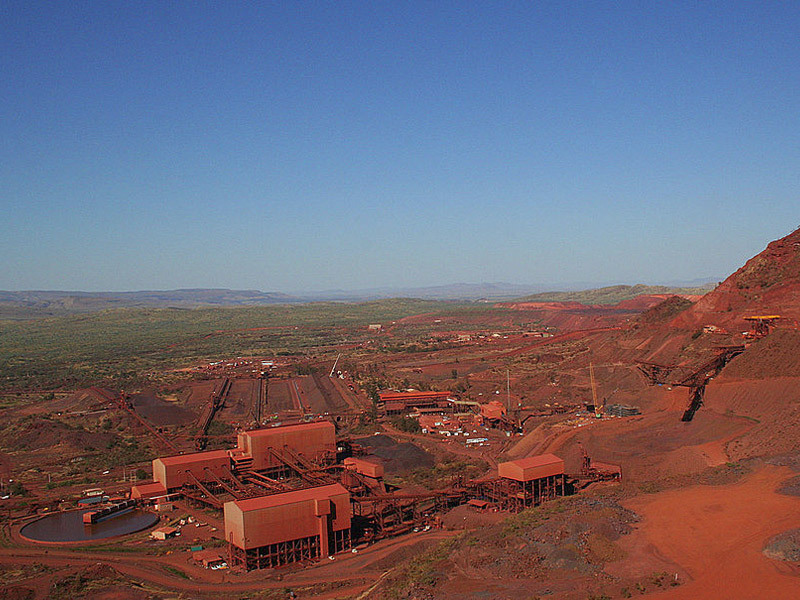 In comparison, the ships of today are sailing with around 255,815 tonnes of iron ore. How times have changed! 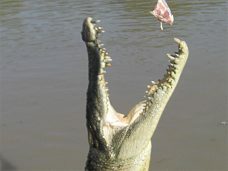 But is it for the better?! Shark Bay & Monkey Mia are part of a world heritage protected area for 26 small species of Australian mammals that nearly went extinct from other animal species and diseases introduced by early settlers. 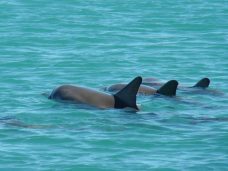 Now fenced off and strictly controlled, the peninsula is a safe haven for those animals to survive and come back from the verge of extinction. 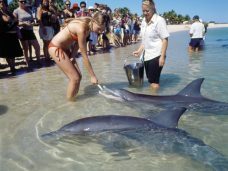 The bay is also home to the well known Bottlenose Dolphin, that, over time, has made Monkey Mia such a popular destination for holiday makers who get to experience nature up close, and turtles that come and nest there as part of their seasonal cycle. 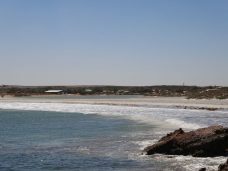 Shark Bay also has one of the world’s largest areas of sea grass and is home to 12 species – the most ever counted in one area in the entire world. 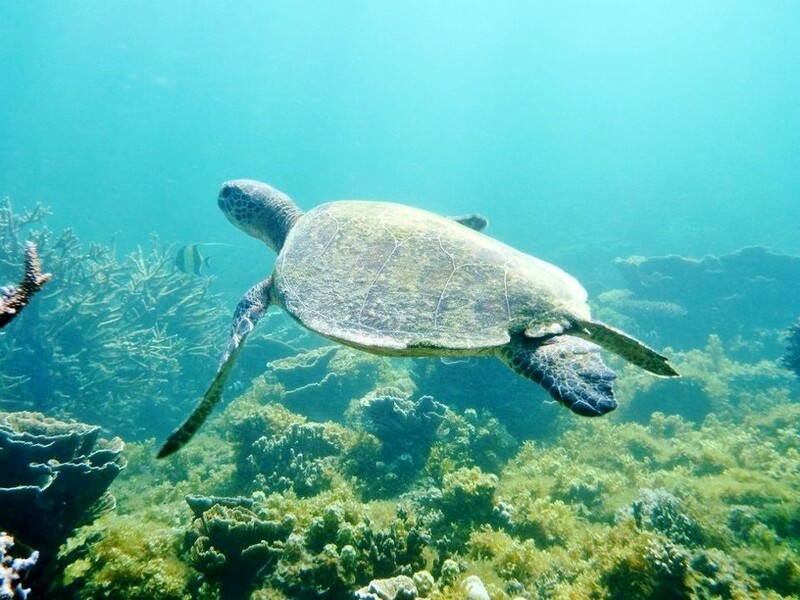 The sea grass is the base link in the food chain and it supports many species of marine life. 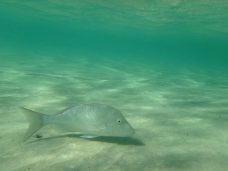 One of which is the Dugong (or Sea Cow) – 13% of the world’s population of Dugong’s in fact. As you would expect with the name “Shark Bay”, sharks and stingrays can also be seen when taking a boat ride out into the bay. 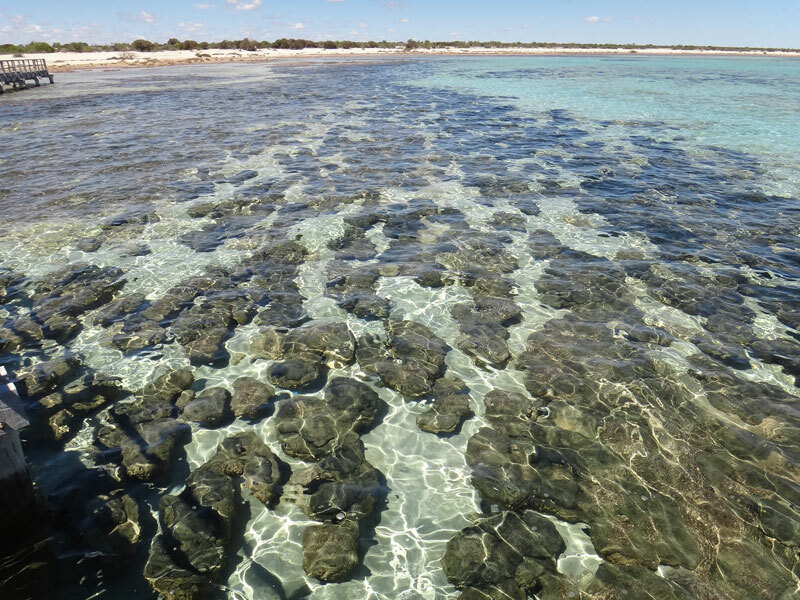 Another wonder of this area are the stromatolites. Stromatolites are one of the planet’s oldest living microbes, dating back as far as 3.5 billion years old and were discovered in Hamelin Pools in 1956 as a living species. Before that they were only known from fossil form as discovered at the North Pole. The connection between the two were established and now Western Australia is recognised to be home of the largest collection of living stromalites in one area, on the planet. 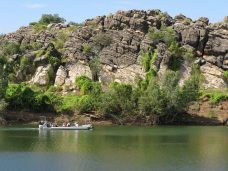 Throughout your journey in this section of the West Coast and it’s hidden treasures there will be time to try your luck catchin’ a fresh fish to eat, and to enjoy the moment. 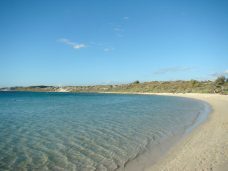 Time to ponder and reflect as you stand on the water’s edge… the tension released from your body… breathin’ the fresh ocean air. 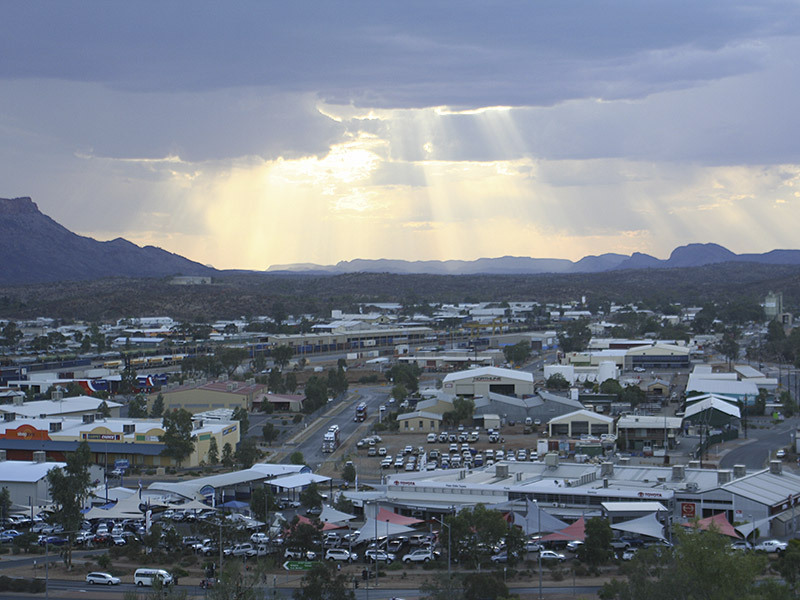 Tennant Creek is a town like no other. 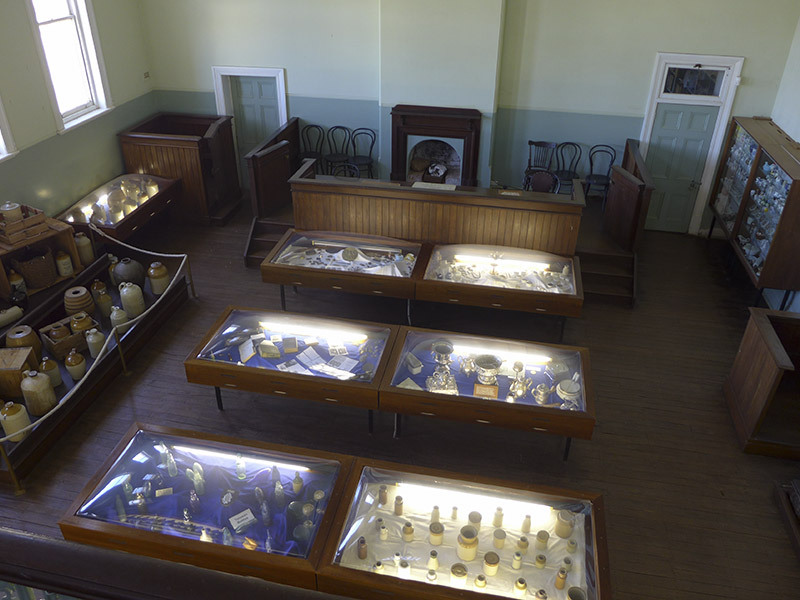 The relaxed feeling of this place gets into your system and slows you down – it can really feel as though you’ve stepped back in time when you enter this town. The flora & fauna that surround Tennant Creek is simply beautiful and this arid region is home to one of the most diverse population of reptiles in the world. It is a little over 500km’s north of Alice Springs and is the name John McDouall Stuart gave to the creek in this region (located 12km’s north of the town). 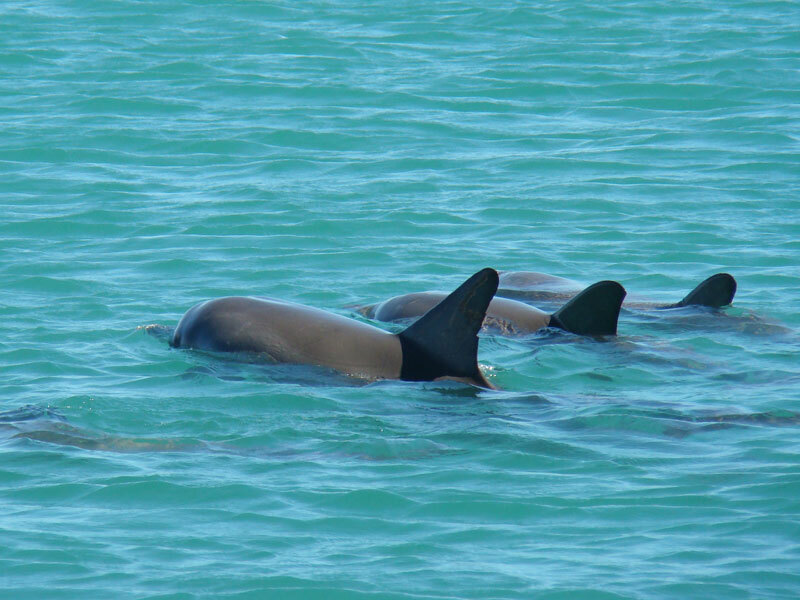 He named it after one the financiers of his expedition, John Tennant. 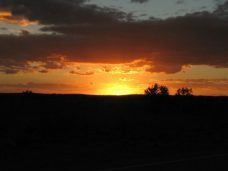 It was the completion of the building of the telegraph repeater station (the southern home for The Pony Express), and the Overland Telegraph Line that saw others move to the region. 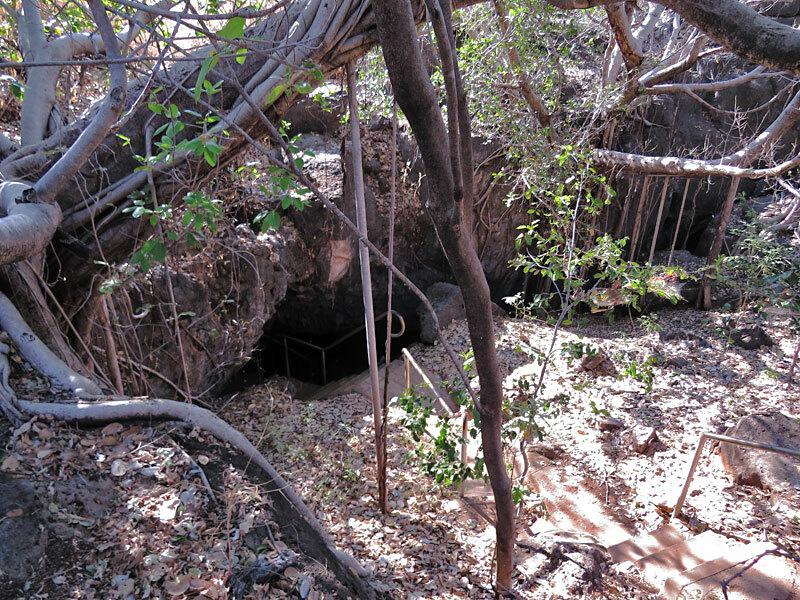 Cattle farmers then moved in along with many in their search for gold. Small amounts of gold had been found through the 1870’s though ‘the big hit’ remained elusive. 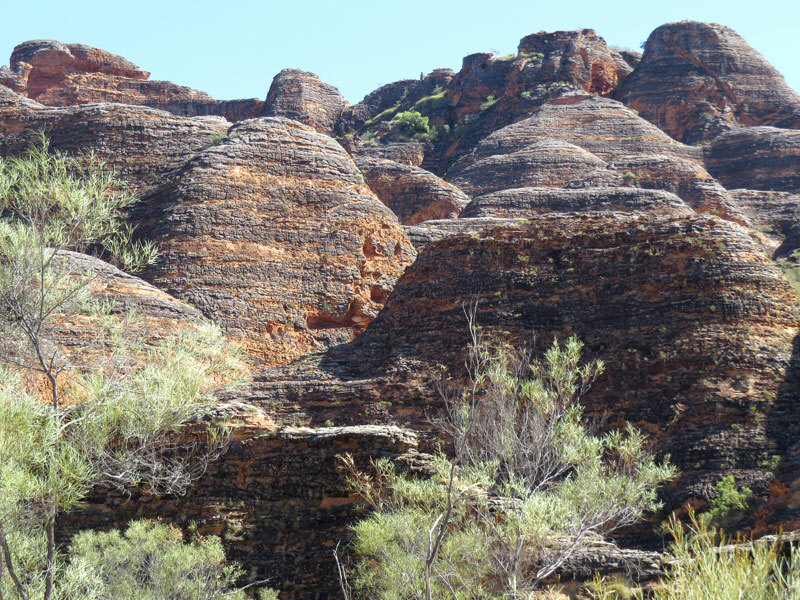 In the early 1930’s gold was found in a rock of ironstone by a local aborigine. 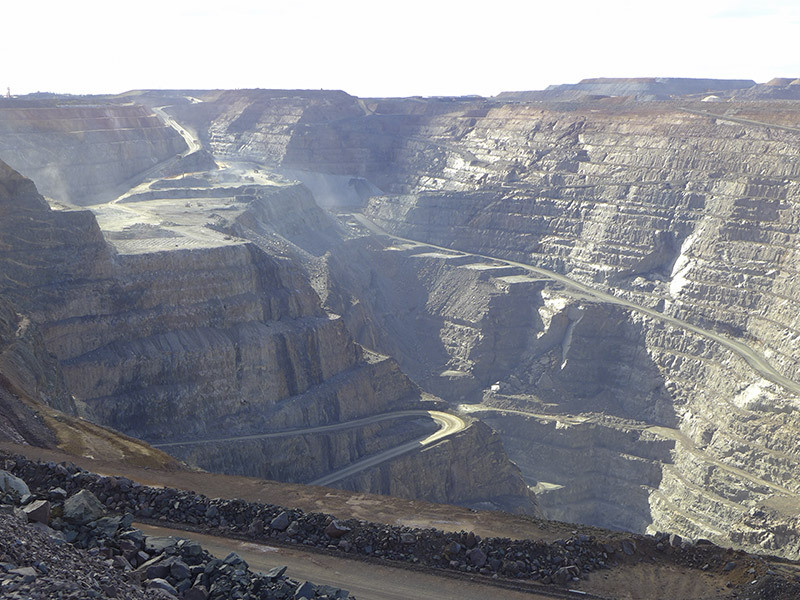 Until then, gold had always been associated with quartz and this new knowledge gave new direction to the miners. 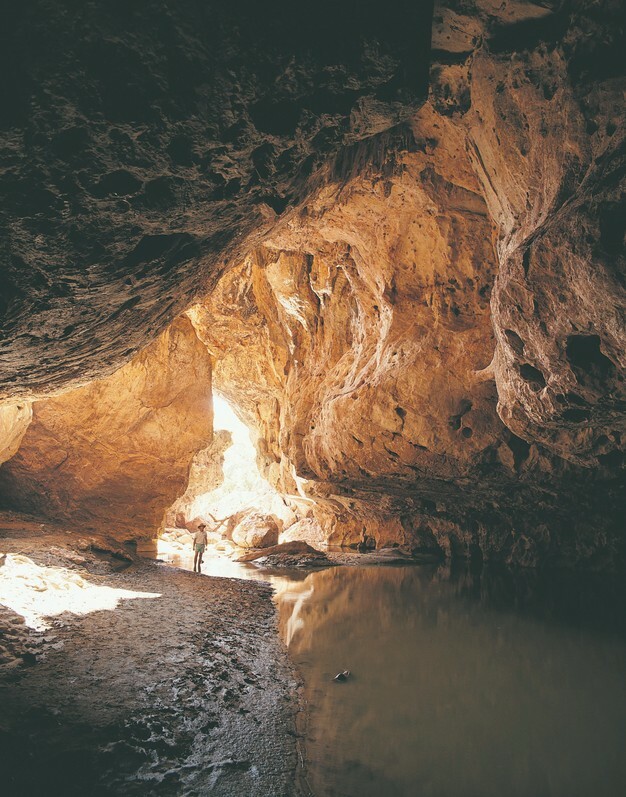 As a result, larger amounts of gold were found and this brought on Australia’s last great gold rush. 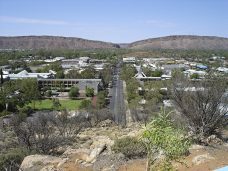 With the numbers in the region growing, the government was forced into building a town and did so where we see it today, naming it Tennant Creek. 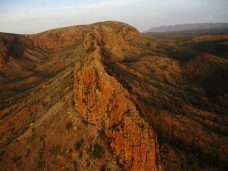 Copper was also found and mined through this land and was quite profitable. 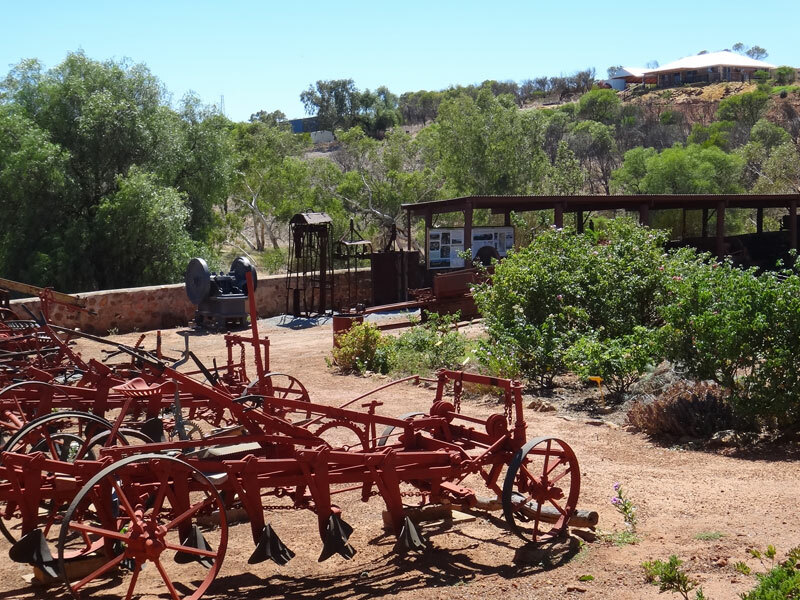 Gold is still sought after out here today and the Repeater Station still sits by the creek today and currently operates as a museum. 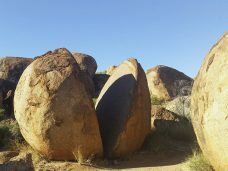 ‘The Pebbles’ (Kunjarra) are not far off the main drag and will give us an idea of what to expect an hour further south when we reach ‘The Devils Marbles’ (Karlu Karlu). Tennant Creek is another unique experience of The Territory where gold (wholeness) can be found at any moment. Tom Price is an Iron Ore mining town amongst the Hamersley Ranges not far from the breathtaking Gorges of Karijini National Park. 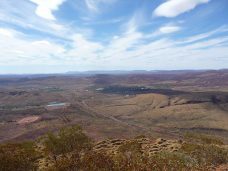 Mining in the area first commenced in the early 1960’s, but only after a bit of a struggle. 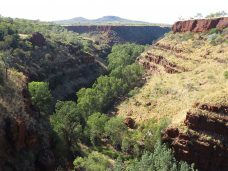 It was Lang Hancock who discovered the rich iron ore deposits in the early 1950’s but couldn’t do anything about it at the time because the commonwealth government had an embargo on the exporting of iron ore and the Western Australian government had a ban on claiming iron ore peggings. 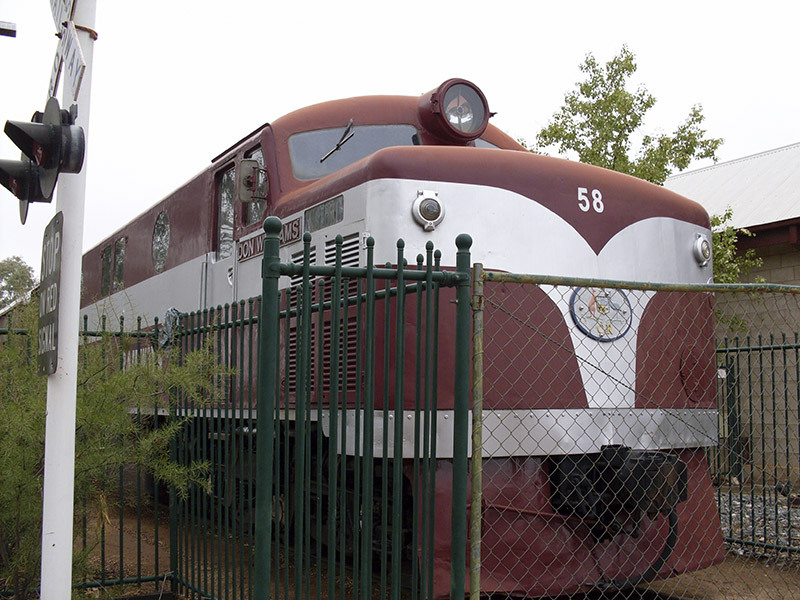 From 1952 to 1961 Hancock fought and lobbied against the government to overturn the embargo. In doing so he struck an royalty agreement with the mining giant Rio Tinto, seeing him earn 12.5 million dollars a year. 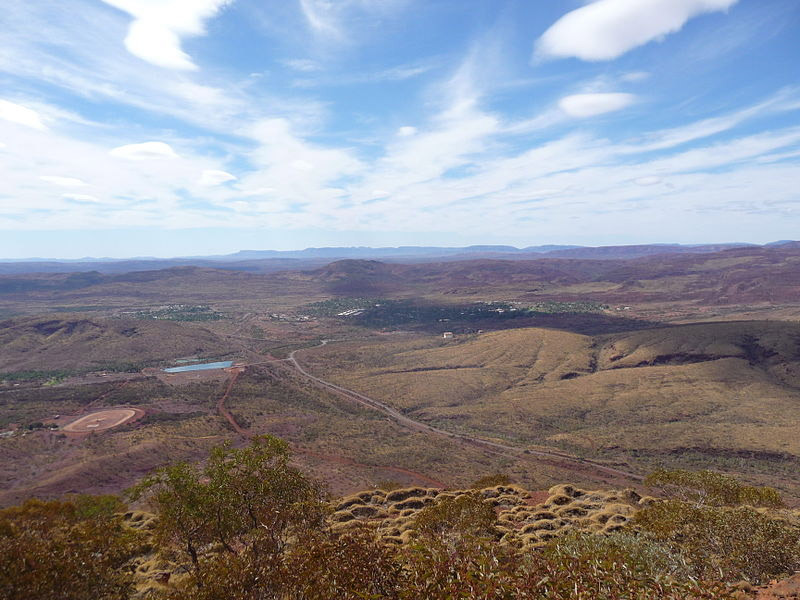 Tours are available in Tom Price to go and find out more about the scale of the mining operation and to better understand how it helps sustain the town and support Australia’s economy.